The Bone Morphogenetic Protein (BMP) family reiteratively signals to direct disparate cellular fates throughout embryogenesis. In the developing dorsal spinal cord, multiple BMPs are required to specify sensory interneurons (INs). Previous studies suggested that the BMPs act as concentration-dependent morphogens to direct IN identity, analogous to the manner in which sonic hedgehog patterns the ventral spinal cord. However, it remains unresolved how multiple BMPs would cooperate to establish a unified morphogen gradient. Our studies support an alternative model: BMPs have signal-specific activities directing particular IN fates. Using chicken and mouse models, we show that the identity, not concentration, of the BMP ligand directs distinct dorsal identities. 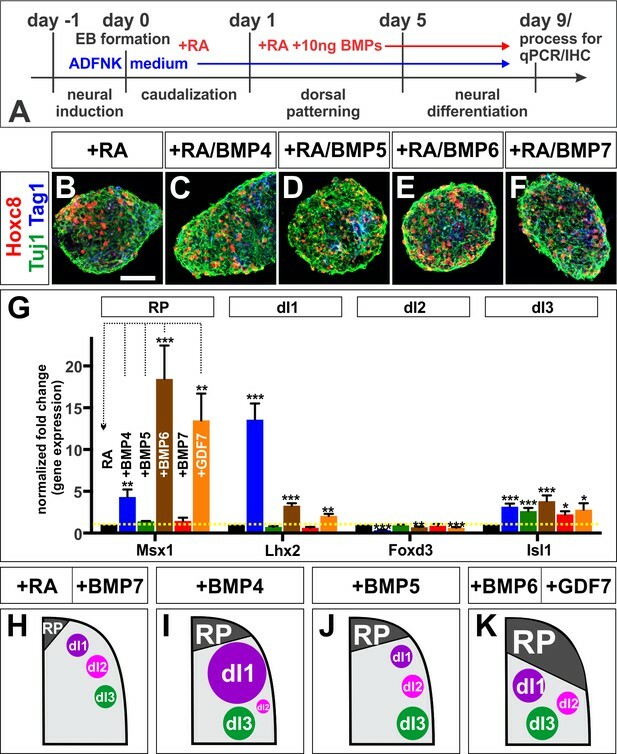 Individual BMPs promote progenitor patterning or neuronal differentiation by their activation of different type I BMP receptors and distinct modulations of the cell cycle. Together, this study shows that a ‘mix and match’ code of BMP signaling results in distinct classes of sensory INs. A common theme in organ development is the existence of signaling centers: restricted sources of inductive growth factors that pattern the identity of surrounding tissues. A notable example of this mechanism is found in the developing spinal cord, which contains two signaling centers, the floor plate (FP) at the ventral midline and the roof plate (RP) at the dorsal midline (Butler and Bronner, 2015). The FP secretes sonic hedgehog (Shh), which has been proposed to act as a morphogen to specify neuronal identity (Briscoe and Ericson, 2001). In this model, neural progenitors adopt their specific identities in response to the local concentration of Shh, which depends on their position with respect to the FP. Progenitors immediately adjacent to the FP become the ventral-most interneurons (INs), while cells progressively further away are specified as motor neurons, and multiple classes of ventral INs (Briscoe and Ericson, 2001). More recent studies have suggested that Shh also acts as a temporal morphogen, such that progenitor identity depends on the duration of exposure to Shh (Kong et al., 2015; Dessaud et al., 2010). Together, these studies have been highly influential, both demonstrating that Shh functions as a textbook example of a morphogen and providing a general mechanism by which inductive signaling centers may specify an array of cellular fates. The RP secretes two families of growth factors, the Bone Morphogenetic Proteins (BMPs) (Liem et al., 1995) and Wnts (Parr et al., 1993). Wnts are thought to act as mitogens, generally promoting dorsal progenitor proliferation (Megason and McMahon, 2002), while the BMPs have been proposed to act as morphogens, patterning dorsal progenitors in a concentration dependent manner similar to Shh (Lee and Jessell, 1999). Studies examining the loss (Hazen et al., 2012; Lee et al., 1998; Wine-Lee et al., 2004; Le Dréau et al., 2012; Nguyen et al., 2000) or gain (Yamauchi et al., 2008; Timmer et al., 2005, 2002; Chizhikov and Millen, 2004) of BMP signaling in vivo have shown that BMP signaling is critical for the formation of the dorsal interneuron (dI) 1, dI2 and dI3 classes of sensory neurons. However, there has been only limited evidence that the BMPs act as morphogens in vertebrates. Experiments analogous to those performed for Shh, demonstrated that conditioned medium from BMP4-tranfected COS cells was sufficient to specify dI1s in chicken neural plate tissue explants (Liem et al., 1997). However, treatment of these explants with diluted BMP4-conditioned medium was not particularly effective at inducing dI3s, the predicted result if BMP4 functions as a morphogen. A more recent study (Tozer et al., 2013), suggested there is a temporal component to BMP4 signaling, such that the longer exposure to BMP4 results in more dorsal progenitor identities in chicken neural plate explants. However, it was not determined how this manipulation affected post-mitotic neural identity. Moreover, none of these studies addressed a key difference between signaling in the RP and FP: there are multiple members of the BMP family present in the dorsal spinal cord, including BMP4, BMP5, BMP6, BMP7 and Growth/Differentiation Factor (GDF) 7 (BMP12). It has remained unresolved how these different factors might cooperate to establish a unified morphogen gradient. An alternative model is that different BMPs have signal-specific effects, such that individual BMPs are responsible for the induction of particular neural fates (Lee and Jessell, 1999). Supporting this hypothesis, loss of function mutations in Gdf7 result in the specific ablation of the Lhx2+ dI1A subpopulation in mouse (Lee et al., 1998), leaving the other dI populations intact. Similarly, knocking down Bmp4 expression in the chicken reduces the number of dI1s, while the loss of Bmp7 was unexpectedly shown to reduce the number of dI1s, dI3s and dI5s (Le Dréau et al., 2012). These findings support the hypothesis that different BMPs have non-redundant functions specifying dorsal cell fates, however they also contradicted previous analyses of Bmp7-/- mice that found no alterations in the number of dI1s (Lee et al., 1998; Butler and Dodd, 2003). Additionally, none of these studies evaluated the role of BMP concentration directing dorsal cell fate in vivo or resolved mechanistically how different BMPs might direct dorsal progenitors towards specific fates. In this study, we have used in ovo electroporation of chicken spinal cords and mouse embryonic stem cell (mESC) cultures to methodically determine how the complement of dorsally expressed BMPs specifies neuronal identity. Both our in vivo and in vitro approaches support the model that the identity of the BMP ligand, rather its concentration, can direct a unique, and species-specific, range of dorsal cellular identities. We find that specific BMPs can promote either progenitor patterning or neuronal differentiation, possibly by their distinct modulations of the cell cycle. Furthermore, the ability to promote patterning or differentiation is mediated through activation of different type I BMP receptors (Bmprs). Together, this study provides insight into the mechanism by which a ‘mix and match’ code of BMP signaling results in the formation of the RP itself, and three distinct classes of sensory INs. Multiple BMPs are present in the dorsal spinal cord (Lee et al., 1998; Liem et al., 1997), and BMP signaling has been shown to be critical for dorsal spinal identity (Hazen et al., 2012; Wine-Lee et al., 2004). However, the mechanism(s) by which different BMPs act to direct distinct dorsal IN identities remain unresolved. To address this question, we assessed the timing by which different BMPs are expressed in the chicken spinal cord (Liem et al., 1997), with respect to markers of dorsal patterning. Pax3, one of earliest general markers of dorsal spinal identity (Mansouri and Gruss, 1998), is expressed in all dorsal progenitors in the ventricular zone (VZ), prior to Hamburger-Hamilton (HH) (Hamburger and Hamilton, 1992) stage 14 (Figure 1A). Dorsal INs arise 12–24 hr after the onset of Pax3 expression. Dorsal interneuron (dI) 1 s are generated from the Atoh1+ + progenitor (dP) one domain (Helms and Johnson, 1998). Atoh1 is expressed by HH stage 18 (Figure 1G), and dI1s start to be born at the brachial levels at the same stage (arrow, Figure 1K). In contrast, Ascl1 expression, which defines the dP3-5 domain (Helms et al., 2005), starts at HH stage 16 (Figure 1N), but is not robust until HH stage 21 (Figure 1P), when the first post-mitotic dI3s are born (arrows, Figure 1T). Timeline of dorsal patterning in the chicken spinal cord. Brachial (A, B, E, F, G, H, I, J, K, L, M, N, Q, U, X, Y, BB) or thoracic (C, D, O, P, R, S, T, V, W, Z, AA) level transverse sections from Hamburger-Hamilton (HH) stage 14–24 chicken spinal cords processed for immunohistochemistry (A–D, I-–L, Q–T) or in situ hybridization (E–H, M–P, U–BB). (A–D) Pax3 is present in dorsal progenitors prior to HH stage 14 and persists throughout dorsal spinal cord patterning and differentiation. (E–H) Atoh1 expression in dP1 progenitors begins prior to HH stage 18. (I–L) Lhx2/9+ dI1 neurons start to be born at the brachial-most levels of HH stage 18 embryos. (M–P) Ascl1 expression in dP3-5 progenitors begins prior to HH stage 16. (Q–T) Isl1+ dI3 neurons are born starting from HH stage 21. (U–X) Bmp4 is expressed in cells flanking the RP prior to HH stage 17 and stays tightly localized to this region in the dorsal spinal cord. (Y–BB) Bmp7 expression starts at ~HH stage 14, and it is expressed more broadly in the dorsal-most spinal cord, including the RP. (CC)A timeline summarizing the onset of Bmp expression and generation of dI1 and dI3 neurons. Scale bar: 50 µm. Of the BMPs known to be expressed in the chicken spinal cord (Liem et al., 1997) only Bmp4 and Bmp7 are expressed in the dorsal spinal cord before the onset of dorsal neurogenesis. Bmp7 expression starts immediately prior to HH stage 15 (Figure 1Y), and is maintained in both the RP and the dorsal-most progenitors (arrows, Figure 1Z-1BB), while Bmp4 is expressed specifically in the RP by HH stage 17 (arrows, Figure 1V). Bmp5, Bmp6 and Gdf7 are not expressed in the dorsal spinal cord at early stages (Figure 1—figure supplement 1A,B,E,F and data not shown). Many of the Bmps are subsequently expressed in the ventral spinal cord by HH stage 24 (Figure 1X and B’, S1D, S1H). Together, this timeline (Figure 1CC) suggests that BMP4 and BMP7 are the relevant BMPs that direct the specification of the dorsal INs in the chicken embryonic spinal cord. We next assessed how the BMPs direct dorsal IN identity by ubiquitously mis-expressing Bmp4 and Bmp7 throughout the chicken spinal cord by in ovo electroporation. We electroporated embryos at HH stage 15, immediately prior to dorsal progenitor patterning (Figure 1CC), and examined the consequence to dorsal cell fate two days later, at HH stage 25. During neurogenesis, the six dorsal progenitor domains, dP1 - dP6, differentiate into distinct populations of sensory INs, including dI1 - dI6 (Figure 2A) (Butler and Bronner, 2015). These populations can be distinguished by their different complements of transcription factors (Figure 2B–C). BMP4 and BMP7 direct distinct dorsal IN identities in vivo. (A–C) Summary of dorsal progenitors (dP1-6) and post-mitotic neurons (dI1-6) in the developing spinal cord. The combinatorial use of antibodies against Lhx2/9 (green), Lhx1/5 (blue), Isl1 (blue), Pax2 (green) and Tlx3 (red) permit the unambiguous identification of dI1-dI5. (D–U) Chicken spinal cords were electroporated at HH stage 15 with Gfp (D, G, J, M, P, S), Bmp4 (E, H, K, N, Q, T) or Bmp7 (F, I, L, O, R, U), under control of the CAG enhancer (Miyazaki et al., 1989), and incubated until HH stage 25. Thoracic transverse sections were labeled with antibodies against Tlx3 (red, S–U), Lhx2/9 (red, J–L), Lhx1/5 (red,M–O), Isl1 (red P-R; green, S–U) or Pax2 (green M-O), pSmad1/5/8 (red, D–F) and Mafb (red, G–I). (D–F) Ectopic expression of Bmp4 (n = 52 sections from 5 embryos, p<0.0001) more effectively activates the R-Smads (Smad1/5/8) than Bmp7 (n = 30 sections 4 embryos, p<0.005), while the expression of Gfp has no effect (n = 37 sections from 4 embryos, p>0.72). (G–I) Mis-expression of Bmp4 or Bmp7 has dramatic, but distinct, effects on dorsal cell differentiation. Specifically, the ectopic expression of Bmp7 (I, n = 28 sections from 4 embryos, p<7.01×10−5) resulted in consistently more Mafb+ RP cells than Bmp4 (H, n = 37 sections from 5 embryos, p<0.12), and the Gfp control (G, n=36 sections from 2 embryos, p>0.67). (J–L, P–R) Mis-expression of Bmp4 however, most effectively directs cells towards the Lhx2/9+ dI1 (K, n = 28 sections from 3 embryos, p<0.0001) and Isl1+ dI3 fates (Q, 91 sections from 5 embryos, p<0.0001) compared to Bmp7 (dI1, L, n = 26 sections from 3 embryos, p<0.0001; dI3, R, n = 59 sections from 5 embryos, p<5.58×10−6). Mis-expression of Gfp has no effect (dI1, J, n = 46 sections from 3 embryos, p>0.47; dI3, P, n = 45 sections from 3 embryos, p>0.46). (P–R) Bmp4 (N, n = 47 sections from 3 embryos, p<0.0001) is the only BMP sufficient to direct cells toward an Lhx1/5+ dI2 identity, while Bmp7 can suppress Pax2+ dI4 fate (O, n = 24 sections from 3 embryos, p<0.01). The ectopic expression of Gfp has no effect (M, n = 35 sections from 3 embryos, p>0.77). Note that the presence of Bhlhlb5 (Skaggs et al., 2011), permitted the Pax2+ Lhx1/5- Bhlhb5- dI4s to be unambiguously distinguished from the Pax2- Lhx1/5+ Bhlhb5- dI2s and the Pax2+ Lhx1/5+ Bhlhb5+ dI6s (data not shown). (S–U) The mis-expression of the BMPs has no effect on the Tlx3+ dI5 fate (S, GFP: n = 38 sections from 3 embryos p>0.16; BMP4: T, n = 50 sections from 4 embryos, p>0.39; BMP7: U, n = 29 sections from 3 embryos, p>0.08) fates. (V) Quantification of the fold change in cell number normalized to Gfp control. The probability Bmp4 and Bmp7 misexpression result in the same distribution of cellular activities is p<0.0002 (Fisher test). (W–Y) Summary of the cellular changes directed by BMP4 and BMP7. We found that there are there are spatial organizational changes for Bmp4, but not Bmp7, misexpression. While the RP, dI1 and dI3 populations remain in the correct spatial order with respect to each other, the dI2s both expand and change location, such that they are intermingled with/ventral to the dI3 population. Probability of similarity between control and experimental groups, *=p<0.05, **p<0.005, ***p<0.0005. Student’s t-test or Mann-Whitney test. Scale bar: 65 µm. Electroporation of either Bmp4 or Bmp7 results in high levels of phosphorylated (p), activated Smad1/5/8 (Faure et al., 2002) (Figure 2E, F and V), showing that both of these BMPs upregulate the BMP signaling pathway compared to control electroporations. However, BMP4 is far more effective, upregulating pSmad1/5/8 levels by ~65%, compared to ~30% for BMP7. Moreover, the ectopic expression of the two Bmps have different consequences for dorsal IN identity. Both BMP4 and BMP7 can increase the numbers of RP, dI1 and dI3 cells, however they do so to markedly different extents. Bmp7 consistently increases the number of Mafb+ RP cells (Figure 2G–I and V). In contrast, Bmp4 has a variable effect on the number of Mafb+ RP cells which does not rise to statistical significance, while it most effectively increases the number of Lhx2/9+ dI1s (Figure 2J–L and V) and Isl1+ dI3s (Liem et al., 1997) (Figure 2P–R). Only Bmp4 is sufficient to increase the number of Lhx1/5+, Pax2- dI2s (Liem et al., 1997; Gross et al., 2002) (Figure 2M–O). While the more-ventral dorsal IN populations have been shown to be independent of RP-signaling (Lee et al., 2000), we found that misexpression of Bmp7 can modestly decrease the number of Pax2+ dI4s (Burrill et al., 1997). These results suggest that BMPs direct dorsal patterning in signal-specific manner. Supporting this model, the misexpression of Bmp5 and Gdf7 also affects dorsal IN identity in a signal-specific way (Figure 2—figure supplement 1). Thus, each BMP has a unique range of effects on the specification of dorsal IN populations in vivo. A different complement of BMPs is present in the dorsal spinal cord in mouse embryos, including BMP5, BMP6, BMP7 and GDF7 (Figure 1—figure supplement 1) (Lee et al., 1998), compared to the chicken, suggesting that the code of BMPs that specifies dorsal spinal identity may differ in different species. We addressed this question by assessing whether different BMPs can direct mouse embryonic stem cells (mESCs) towards specific dorsal IN identities. This approach also allowed us to determine the role of different BMPs on naïve tissue with minimum complication from endogenous BMP signaling. We established a directed differentiation protocol for dorsal spinal identity by modifying the protocol used to differentiate mESCs into spinal motor neurons (Figure 3—figure supplement 1) (Wichterle and Peljto, 2008). Aggregated mESCs, or embryoid bodies (EBs), were treated with 10 ng/ml of different BMP recombinant proteins, in addition to retinoic acid (RA) (Figure 3A). This protocol directs EBs toward a Tuj1+ Hoxc8+ caudal cervical/rostral thoracic spinal identity (Figure 3B–F) (Philippidou and Dasen, 2013). BMPs direct distinct dorsal IN identities in vitro. (A) Summary of the mESC differentiation protocol. (B–F) RA treatment ±10 ng BMPs directs EBs towards a caudal (Hoxc8+), neural (Tuj1+) and dorsal (Tag1+) spinal identity. (G) Quantification of RT-qPCR expression data from 9 day EBs, normalized to RA control (n = 5 experiments). BMP6 (n = 5 independent experiments, p<0.0005) and GDF7 (n = 5 experiments, p<0.001) are sufficient to increase Msx1 (i.e. RP) expression, whereas BMP4 (n = 5 experiments, p<1.08×10−7) is most effective at directing Lhx2 (dI1) expression. All BMPs tested, including BMP5 (n = 3 experiments, p<0.0002) and BMP7 (n = 2 experiments, p<0.02) elevate Isl1 (dI3) expression. No BMP tested is sufficient to elevate Foxd3 (dI2) expression. In each independent experiment, all samples were run in triplicate. (H–K) Summary of cell fates changes in mESC experiments. Probability of similarity between control and experimental groups, *=p < 0.05, **p<0.005, ***p<0.0005, Student’s t-test. Scale bar: 65 µm. Similar to our observations in vivo, we found that each BMP has a unique range of effects on the differentiation of sensory INs in vitro. Thus, BMP6 most effectively drives the expression of Msx1, a RP marker, while BMP4 most effectively directs mESCs to express Lhx2, a marker of dI1s. All BMPs tested can direct mESCs towards Isl1+ dI3s (Figure 3G). However, BMP7 protein had only a modest effect on dorsal IN identity in this assay (Figure 3G–H), supporting previous analyses (Lee et al., 1998; Butler and Dodd, 2003) and suggesting that mouse BMP6 is the functional analog of chicken BMP7 in this context. Moreover, no BMP was found to direct mESCs towards the Foxd3+ dI2 population, even when we tested a number of different combinations of BMPs, including a mixture of ‘all’ BMPs (i.e. BMP4, BMP5, BMP6, BMP7 and GDF7) (Figure 3—figure supplement 2). Nonetheless, these studies support the model that the BMPs have different effects directing the differentiation of the dorsal spinal IN populations, and that the specific activities of a given BMP are not necessarily evolutionarily conserved between species. Previous studies have suggested that the BMPs act as either a spatial (Liem et al., 1997) or temporal (Tozer et al., 2013) morphogen to pattern dorsal spinal identity, largely by analogy with Shh patterning of the ventral spinal cord (Briscoe and Novitch, 2008). The canonical spatial morphogen model predicts that a high concentration of BMPs directs the dorsal-most spinal identities, while progressively lower concentrations of BMPs specify the dI2s, and then dI3s. In contrast, the temporal morphogen model predicts that the length of exposure to BMPs should be critical, with a given concentration of a BMP specifying first the dI3s, and then the dI1s over time. However, if BMPs rather act in a signal-specific manner, then a particular BMP ligand should direct the same range of cellular identities regardless of concentration. We evaluated these models in both our in vivo and in vitro model systems. We altered the level of induced BMP4 signaling in vivo by in ovo electroporating different ratios of the CAG::gfp and CAG::Bmp4 vectors into chicken embryos, keeping the total concentration of DNA constant at 500 ng/μl. We examined a concentration series consisting of 5 ng/μl CAG::Bmp4 (i.e. a ratio of 99:1 CAG::Gfp: CAG::Bmp4), 25 ng/μl CAG::Bmp4 (19:1), 50 ng/μl CAG::Bmp4 (9:1) to 500 ng/μl CAG::Bmp4. This concentration range resulted in a relatively linear increase in Smad1/5/8 activity: as the concentration of CAG::Bmp4 increased, pSmad1/5/8 also increased between ~20% to~130% compared to control electroporations (Figure 4A–C,J). Strikingly, the different concentrations of Bmp4 were able to direct the same range of cellular fates: all conditions resulted in increased numbers of dI1s, dI2s and dI3s (Figure 4D–I), however the effects became progressively larger as the concentration of BMP4 increased (Figure 4J). Thus, lower levels of BMP4 did not promote a more ventral-dorsal identity as predicted by the morphogen models. Rather, concentration appears to control the efficiency by which BMP4 can direct the same range of cell fates. The BMPs do not act as morphogens either in vivo or in vitro. (A–I) Chicken spinal cords were electroporated at HH stage 15 with Gfp (A, D, G), [low] Bmp4 (B, E, H) or [high] Bmp4 (C, F, I) under the control of the CAG enhancer, and incubated until HH stage 25. Thoracic transverse sections were labeled with antibodies against pSmad1/5/8 (red, A–C), Lhx2/9 (red, D–F), Isl (green, D–F), Lhx1/5 (red, G–I) and Pax2 (green, G–I). (A–C, J) R-Smad activation increases over a range of ~20% to~130% as the level of Bmp4 misexpression increases. 5 ng/μl CAG::Bmp4, n = 27 sections from 3 embryos, p<0.008 similar to control; 25 ng/ul CAG::Bmp4, n = 14 sections from 2 embryos, p<4.4×10−5; 50 ng/ul CAG::Bmp4, n = 23 sections from 3 embryos, p<2.4×10−8; 500 ng/ul CAG::Bmp4, n = 19 sections from 3 embryos, p<3.6×10−7; Gfp control: n = 27 sections from 3 embryos, p>0.47. (D–I, J) The concentration of BMP4 determines the efficiency of dI1-3 specification in chicken embryos. Thus, high levels of Bmp4 expression direct more Lhx2/9+ dI1s (F, n = 28 sections from 3 embryos, p<1.8×10−16), Lhx1/5+ dI2s (I, n = 22 sections from 3 embryos, p<7.6×10−11) and Isl1+ dI3s (F, n = 28 sections from 3 embryos, p<6.3×10−7) compared to lower concentrations of Bmp4 expression (E, Lhx2/9: n = 29 sections from 3 embryos, p<7.6×10−14; Isl1: n = 29 sections from 3 embryos, p<0.006; H, Lhx1/5: n = 26 sections from 3 embryos, p<5.1×10−7). Expression of Gfp had no effect (Lhx2/9: D, n = 28 sections from 3 embryos, p>0.88; Isl1: D, n = 29 sections from 3 embryos, p>0.89; Lhx1/5: G, n = 29 sections from 3 embryos, p>0.28). (K) Similarly, increasing the concentration of a given BMP improves its ability to direct mESCs towards a specific dorsal fate, as measured by increased gene expression. BMP4: n = 4 independent experiments; BMP5: n = 3 experiments; BMP6: n = 2 experiments; BMP7: n = 2 experiments. Samples were run in triplicate within each experiment. Probability of similarity between control and experimental groups, *p<0.05, **p<0.005, ***p<0.0005, Student’s t-test or Mann Whitney test. Scale bar: 80 µm. We more rigorously assessed the ability of BMPs to act as spatial morphogens in vitro by determining whether altering the concentration of BMP4, BMP5, BMP6 or BMP7 can direct EBs towards different dorsal spinal fates. Using a 0.15 ng/ml - 20 ng/ml concentration range, we again observed that the concentration of a given BMP controls the efficiency by which it drives its specific range of cellular identities (Figure 4K). Specifically, BMP4 can direct EBs to express Lhx2 (dI1) and Isl1 (dI3), and increasing the concentration of BMP4 drives EBs to express progressively higher levels of both Lhx2 and Isl1. Similarly, increasing BMP6 levels results in progressively higher levels of Msx1 and Isl1 suggesting that ‘high’ BMP6 concurrently directs more cells to become RP and dI3s (Figure 4K). In no case did we observe that low versus high concentrations of BMPs can direct the ventral-dorsal versus dorsal-most cellular identities predicted by the spatial morphogen model. We further considered whether our data fit with the proposed temporal model (Tozer et al., 2013), which predicts that prolonged BMP signaling will direct more dorsal identities. However, we found no evidence that changing the length of time that EBs are exposed to BMPs led to progressive dorsalization (Figure 4—figure supplement 1). Thus, our studies support a signal-specific model where each BMP ligand can direct progenitors towards a unique range of dorsal spinal identities. We next examined the mechanistic basis by which BMP4 and BMP7 direct distinct dorsal spinal identities in chicken embryos. 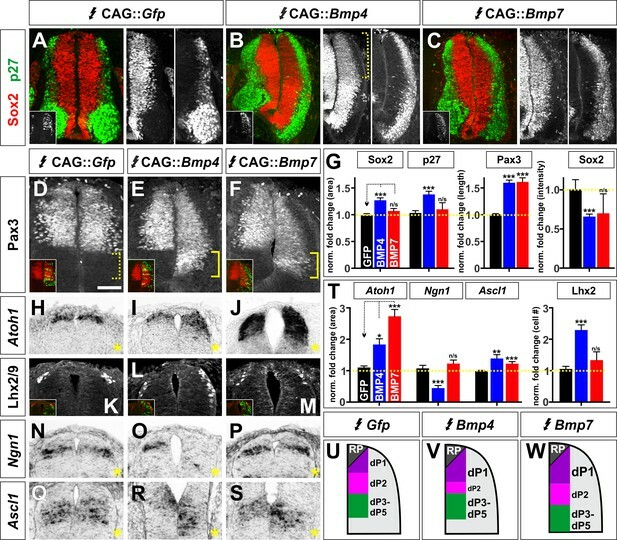 We first assessed how broadly Bmp4 or Bmp7 misexpression affects neural development by examining their effect on Sox2+ progenitors (Bylund et al., 2003) and p27/Kip1+ differentiated neurons (Novitch et al., 2001) (Figure 5A–C). Neither Bmp4 nor Bmp7 misexpression changed the ratio of Sox2+ progenitors to p27/Kip1+ neurons (Figure 5A–C,G), although the spinal cord was generally more elongated after Bmp4 expression (Figure 5B,G). However, Bmp4 misexpression significantly diminished (p<1×10−12) the intensity of Sox2 in dorsal progenitors (bracket, Figure 5B,G), suggesting that progenitor identity is being eroded, perhaps because the cells are preparing to differentiate. 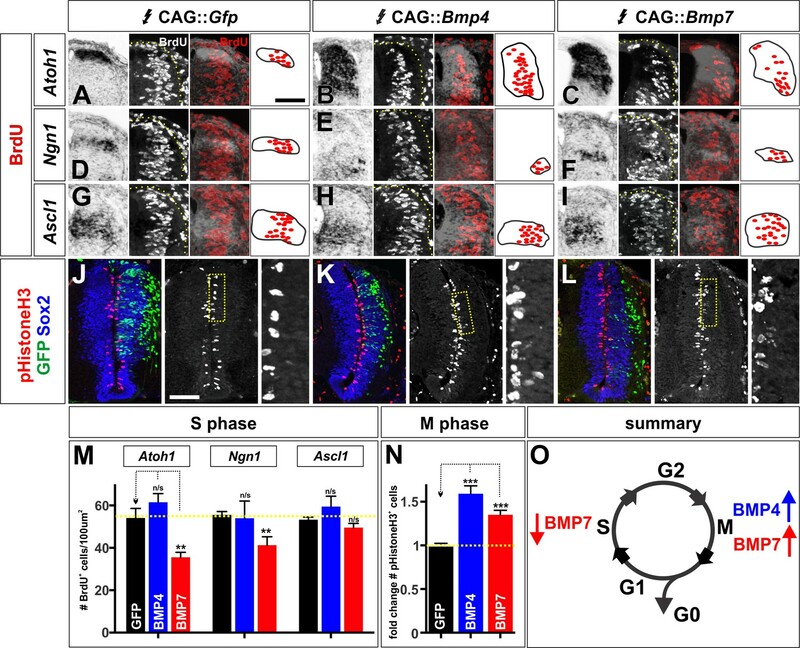 BMP4 and BMP7 can drive distinct dorsal progenitor identities in vivo. (A–S) Chicken spinal cords were electroporated at HH stage 15 with Gfp (A, D, H, K, N, Q), Bmp4 (B, E, I, L, O, R) or Bmp7 (C, F, J, M, P, S) under the control of the CAG enhancer, and incubated until HH stage 25 (A–F) or 20 (J–S). Thoracic transverse sections were labeled with antibodies against Sox2 (red, A–C), p27 (green, A–C) or Lhx2/9 (K–M) or processed for in situ hybridization (H–J, N–S). Note that Bmp misexpression affects progenitor identity on both sides of the spinal cord, thus it is critical to compare the experimental manipulations to the GFP electroporation control. 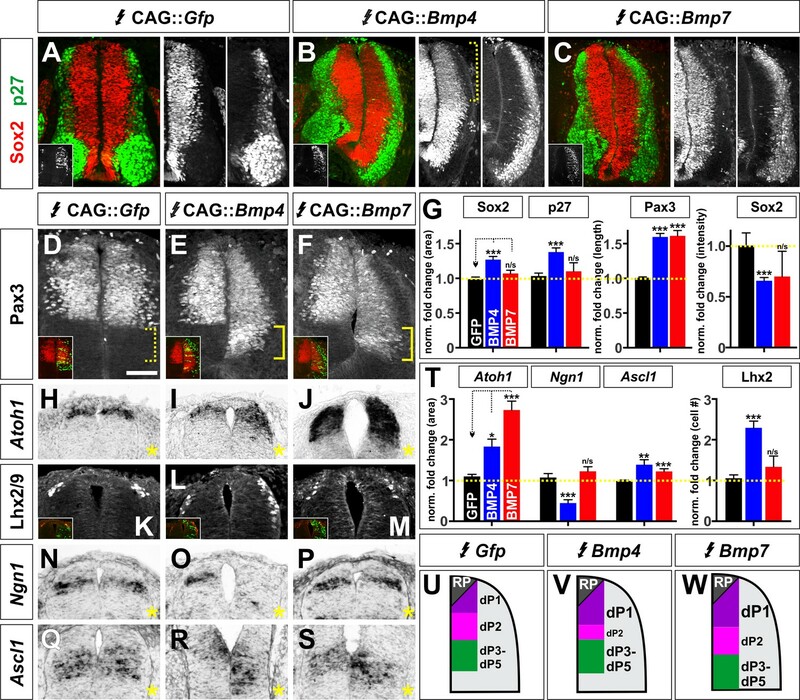 (A–C, G) The ratio of progenitors to neurons was not affected by the misexpression of Gfp (n = 40 sections from 3 embryos), Bmp4 (n = 47 sections from 4 embryo) or Bmp7 (n = 27 sections from 3 embryos), although the spinal cord was generally elongated in Bmp4 electroporated embryos (A–C, G). Bmp4 misexpression also significantly diminished Sox2 intensity by >30% in the dorsal spinal cord (bracket, B, p<9.22×10−13). (D–G) Misexpression of Bmp4 (n = 50 sections from 5 embryos, p<5.2×10−19) and Bmp7 (n = 29 sections from 3 embryos, p<9.6×10−17) significantly increases the size of the Pax3+ domain compared to Gfp control (n = 44 sections from 3 embryos, p>0.95). (H–J) The misexpression of Bmp4 (n = 54 sections from 4 embryos, p<0.006) and Bmp7 (n = 25 sections from 3 embryos, p<3.0×10−14) results in a 2–3 fold increase in the area of the Atoh1+ +1 domain compared to Gfp control (n = 42 sections from 6 embryos, p>0.16). (K–M) 24 hr post-electroporation, Bmp4 expression (n = 25 sections from 3 embryos, p<2.35×10−10) increases the number of Lhx2/9+ dI1s while the expression of Gfp (n = 34 sections from 3 embryos, p>0.6) or Bmp7 (n = 25 sections from 3 embryos, p>0.74) has no significant effect. (N–P) Bmp4 (n = 44 sections from 3 embryos, p<0.0001) decreases the size of the Ngn1+ dp2 domain while neither Gfp (n = 176 sections from 8 embryos, p>0.23) or Bmp7 (n = 41 sections from 3 embryos, p>0.62) expression has a significant effect. (Q–S) The misexpression of both Bmp4 (n = 48 sections from 3 embryos, p<0.003) and Bmp7 (n = 45 sections from 3 embryos, p<4.2×10−5) significantly increase the Ascl1+ dP3-5 populations compared to Gfp control (n = 124 sections from 8 embryos, p>0.73). (T) Quantification of the fold change in progenitor domain area or cell number normalized to the GFP control. (U–W) Summary of changes to progenitor identity directed by BMP4 or BMP7. Probability of similarity between control and experimental groups, *p<0.05, **p<0.005, ***p<0.0005, Student’s t-test or Mann-Whitney test. Scale bar: 50 µm. We then looked more specifically at the ability of BMP4 and BMP7 to mediate dorsal progenitor identity, at HH stage 20, a day after electroporation. Ectopic expression of either Bmp4 or Bmp7 increased the length of the Pax3+ dorsal progenitor domain by ~60% (Figure 5D–G). However, the two BMPs had markedly different effects on individual progenitor identities within this domain. Bmp7 had the most dramatic effect on the area of the Atoh1+ dp1 domain (Figure 5J), with a more modest effect on the Ascl1+ dp3-5 domain (Figure 5S) and no effect on the Ngn1+ dp2 domain (Figure 5P). In contrast, Bmp4 can increase the area of both the Atoh1+ dp1 and Ascl1+ dp3-5 domains (Figure 5I,R), but markedly decreases the size of the Ngn1+ dp2 domain (Figure 5O). Taken together, these results suggest that the ability of BMP4 and BMP7 to instruct specific ranges of dorsal spinal fates stems from their differential effects on dorsal progenitors. Based on previous studies showing that BMPs can regulate proliferation and neurogenesis (Shou et al., 2000; Shi and Liu, 2011), we hypothesized that the differential effects of BMP4 and BMP7 on dorsal progenitors arise from BMPs having distinct effects on progression through the cell cycle. A progenitor-patterning factor might speed up cell cycle transitions, whereas a differentiation factor might promote cell cycle exit. Using BrdU as a marker for cells in synthesis (S) phase (Djordjevic and Szybalski, 1960), we found that misexpression of Bmp7, but not Bmp4, can decrease the number of BrdU+ cells in the dP1 and dP2 domains in vivo (Figure 6A–I,M). In contrast, ectopic expression of both Bmp4 and Bmp7 increases the number of pHistoneH3+ cells i.e. cells in mitosis (M)-phase (Goto et al., 1999) (Figure 6J–L,N). Thus, BMP4 and BMP7 have different effects on the cell cycle in the chicken spinal cord: BMP7 can simultaneously decrease the number of cells in S-phase and increase the number of cells in M-phase, consistent with shortening the duration of the cell cycle. In contrast, BMP4 specifically increases the number of dividing cells only. The BMPs can differentially regulate the cell cycle in vivo. (A–L) Chicken spinal cords were electroporated at HH stage 15 with Gfp (A, D, G, J), Bmp4 (B, E, H, K) or Bmp7 (C, F, I, L) under the control of the CAG enhancer and incubated until HH stage 20. Thoracic transverse sections were labeled with antibodies against pHistoneH3 (red, J–L) and Sox2 (blue, J–L). In situ hybridization was performed in combination with BrdU labeling (white/red, A–I). (A–I) Bmp7 (Atoh1: n = 25 sections from 5 embryos, p<0.005; Ngn1: n = 41 sections from 5 embryos, p<0.001; Ascl1: n = 45 from 5 embryos, p>0.13) misexpression decreases the number of S-phase BrdU+ cells per 100 um2 in the dP1-dP2 domains while neither Gfp (Atoh1: n = 42 sections from 6 embryos, p>0.96; Ngn1: n = 176 sections from 8 embryos, p>0.54; Ascl1: n = 124 sections from 8 embryos, p>0.73) or Bmp4 expression (Atoh1: n = 54 sections from 4 embryos, p>0.16; Ngn1: n = 44 sections from 3 embryos, p>0.28; Ascl1: n = 48 sections from 3 embryos, p>0.25) has no effect. (J–L) Both Bmp4 (n = 47 sections from 3 embryos, p<2.2×10−9) and Bmp7 misexpression (n = 77 sections from 3 embryos, p<0.0001) can increase the number of pHistoneH3+ M-phase cells compared to Gfp control (n = 60 sections from 3 embryos, p>0.81). (O) The combined effect of the BMPs on the cell cycle may permit BMP7 to most effectively promote progenitor patterning while BMP4 most effectively directs neural differentiation. Probability of similarity between control and experimental groups, *p<0.05, **p<0.005, ***p<0.0005 Student’s t-test or Mann-Whitney test. Scale bar: 70 µm. We further evaluated the effect of BMPs on cell cycle dynamics, by assessing these cell cycle markers in mESCs treated with BMP4, BMP5, BMP6, BMP7 or GDF7. We found that only BMP4 and BMP6 were able to affect these markers as neural progenitors progress through the cell cycle (Figure 7B,D,S). Strikingly, treatment with BMP4 resulted an ~2 fold increase in the number of cells in S-phase (Figure 7H,S) and M-phase (Figure 7N,T). In contrast, BMP6 had a more modest effect increasing the number of cells in S-phase only (Figure 7J,P,S,T). Thus, our in vitro studies are consistent with those in vivo in that different BMPs have distinct effects modulating the cell cycle. They also support the hypothesis that mouse BMP6 is the functional analog of chicken BMP7. The BMPs differentially regulate the cell cycle in vitro. (A–R) Treatment of mEBs with RA ±10 ng BMPs directs them all towards Pax3+ dorsal spinal fates. However, different BMPs have distinct effects promoting different phases of the cell cycle. BMP5 (C, n = 32 sections 3 independent experiments; I: BrdU, p>0.26; O: pHistoneH3, p>0.24), BMP7 (E, n = 27 sections 3 independent experiments; K: BrdU, p>0.09, Q: pHistoneH3, p>0.85), and GDF7 (F, n = 40 sections 3 independent experiments; L: Brdu, p>0.22, R: pHistoneH3, p>0.24) had no effect either S phase or M phase, compared to RA control (A, G, M, n = 21 sections 3 independent experiments). In contrast, BMP4 both increased the number of S-phase cells (B, n = 50 sections 3 independent experiments; H: BrdU, p<1.15×10−6) and the number of M-phase cells (B, N: pHistoneH3, p<0.04), while BMP6 only increased the number of S-phase cells (D, n = 32 sections 3 independent experiments; J: BrdU, p<0.01) with no effect on the number of cells in mitosis (D, R: pHistoneH3, p<0.83). (S–T) Quantification of the number of BrdU +(S) and pHistoneH3+ (T) cells per 100 um2. BMP treatment had no effect on EB size (data not shown). (U) Summary of the effects of BMP6 and BMP7 on cell cycle in vitro. BMP4 simultaneously increases the number of cells in S-phase and M-phase, consistent with prolonging cell cycle length. In contrast, BMP6 specifically increases the number of cells in S-phase with no effect on M-phase, possibly promoting proliferation. Probability of similarity between control and experimental groups, *=p < 0.05, **p<0.005, ***p<0.0005, Student’s t-test or Mann-Whitney test. Scale bar: 80 µm. Taken together, the activities of the BMPs in vivo are consistent with a model where both BMP7 and BMP4 drive progenitor patterning, while BMP4 directly promotes neuronal differentiation (Figure 6O). We assessed this model by examining the timing by which Bmp4 or Bmp7 expression can direct dI1 differentiation. Both Bmps can increase the size of the dP1 domain, 24 hr post-electroporation (Figure 5T), and the numbers of dI1s, 48 hr post-electroporation, with BMP4 exerting the largest effect (Figure 2V). However, only the misexpression of Bmp4 results in increased dI1 differentiation within 24 hr after electroporation (Figure 5L,T). Thus, only BMP4 appears to instruct endogenous progenitors to differentiate as dI1s, while BMP7 increases the number of dI1s as a secondary consequence of promoting increased dP1 patterning. Collectively these studies support the hypothesis that the BMPs have signal-specific effects on progenitor patterning and differentiation, which may be mediated by regulating cell cycle dynamics. Supporting this model, the misexpression of either Bmp5 or Gdf7 in vivo also uniquely affects the patterning of dorsal progenitors and their progression through the cell cycle (Figure 6—figure supplement 1). Finally, we assessed whether the distinct effects of these BMPs on dorsal spinal neurogenesis are a consequence of differential signaling through distinct receptor complexes. The BMPs bind to a complex of type I and type II BMP receptors (Bmprs). Previous studies have suggested that the BMP type I receptors, BmprIa (Alk3) and BmprIb (Alk6), are expressed in progenitors and neurons respectively and mediate different aspects of embryonic development (Yamauchi et al., 2008; Panchision et al., 2001). We confirmed that the type I Bmprs have similarly distinct distributions in the developing chicken spinal cord. BmprIa is expressed in progenitors prior to HH stage 18 and remains restricted to the VZ (Figure 8A–C). In contrast, BmprIb expression starts by HH stage 21 and continues to be present in both progenitor and neuronal domains by HH stage 24 (Figure 8D–F). BMP4 and BMP7 mediate their diverse activities through different type I Bmp receptors both in vivo and in vitro. (A–C) BmprIa is expressed in spinal progenitors during neurogenesis. (D–F) At later stages, BmprIb is also expressed by both progenitors and post-mitotic neurons. (G–L) Chicken spinal cords were ubiquitously electroporated with Gfp (G, J), dnBmprIa (H, K) or dnBmprIb (I, L) at HH stage 15 and incubated until HH stage 25. Thoracic transverse sections were labeled with antibodies against Lhx2/9 (red, G–I), Isl1 (green, G–I), Lhx1/5 (red, J–L) and Pax2 (green, J–L). (G–M) The misexpression of dominant negative (dn) BmprIb decreases the Lhx2/9+ dI1 (I, n = 81 sections from 4 embryos, p<1.73×10−24), Lhx1/5+ dI2 (L, n = 58 sections from 4 embryos, p<2.3×10−10) and Isl1+ dI3 (I, n = 59 sections from 4 embryos, p<0.0003) populations compared to Gfp control (G, Lhx2/9: n = 45 sections from 5 embryos, p>0.23; J, Lhx1/5: n = 44 sections from 5 embryos, p>0.73; G, Isl1: n = 46 sections from 5 embryos, p>0.55). In contrast, the presence of dnBmprIa decreases the number of dI1s (H, n = 55 sections from 3 embryos, p<1.75×10−13) and dI3s (H, n = 35 sections from 3 embryos, p<2.37×10−5), but not the dI2s (K, n = 53 sections from 3 embryos, p>0.07). (N) Increasing the levels of Bmp4 expression is sufficient to rescue the dnBmprIa, but not dnBmprIb, phenotype (BMP4: n = 40 sections from 3 embryos; BMP4 low + dnIa: n = 51 sections from 3 embryos, p<3.93×10−28; BMP4 high + dnIa: n = 32 sections from 5 embryos, p>0.88; BMP4 low + dnIb: n = 43 sections from 3 embryos, p<7.17×10−29; BMP4 high + dnIb: n = 42 sections from 6 embryos, p<8.44×10−9), while high levels of Bmp7 are most effective at rescuing the dnBmprIb, rather than dnBmprIa, phenotype (BMP7: n = 42 sections from 3 embryos; BMP7 low + dnIa: n = 57 sections from 3 embryos, p<0.008; BMP7 high + dnIa: n = 31 sections from 4 embryos, p<0.0004; BMP7 low + dnIb: n = 58 sections from 3 embryos, p<0.0001; BMP7 high + dnIb: n = 23 sections from 4 embryos, p>0.98). (O–P) Low concentrations of either dorsomorphin (DM) or LDN-193189 (LDN) are sufficient to block the activity of BMP6 in vitro, consistent with the model that BMP6 acts through BmprIa. In contrast, much higher concentrations of either DM or LDN are required to block BMP4-directed differentiation, suggesting BMP4 acts through BmprIb (n = 4 independent experiments). (Q–T) Models for the specification of the RP, dI1s, dI2s and dI3s. Probability of similarity between control and experimental groups, *=p<0.05, **p<0.005, ***p<0.0005 Student’s t-test or Mann-Whitney test. Scale bar: 65 µm. To assess the effects of BmprIa and BmprIb on dorsal IN identity, we electroporated dominant negative forms of the type I Bmprs (Lim et al., 2005) into chicken embryos. Both dnBmprIa and dnBmprIb were able to block the formation of Lhx2/9+ dI1s and Isl1+ dI3s (Figure 8G–I). However dnBmprIb was significantly (p<1×10−5) more effective at reducing the number of dI1s (Figure 8M) and was the only BmprI that decreases the number of Lhx1/5+ Pax2- dI2s (Figure 8L,M). Thus, dnBmpIb appears to block the dorsal IN populations specified by BMP4, whereas dnBmprIa may be blocking the activities mediated by BMP7. We further assessed this possibility in both our in vivo and in vitro model systems. We performed a rescue experiment in vivo, to determine whether it was possible to overcome the receptor blockade with co-electroporation of either BMP4 or BMP7. Supporting our hypothesis, we found that increasing the levels of BMP4 are able to fully rescue the effects of dnBmprIa, but not dnBmprIb (Figure 8N), i.e. BMP4 is able to circumvent blocking BmprIa, possibly by activating endogenous BmprIb, but BMP4 is not able to circumvent the effect of inhibiting BmprIb. The results with BMP7 are less clear-cut, however the specificity does appear to be reversed: high levels of BMP7 are only able to fully rescue the effects of dnBmprIb. We also assessed whether the differentiation activity of BMP4 or BMP6, which has comparable activities to chicken BMP7 for mESCs, could be blocked by inhibiting different type I receptors in our mESC in vitro assay. We used two BMP receptor inhibitors, dorsamorphin and LDN-193189 (Cuny et al., 2008), which inhibit BmprIa at low concentrations, but only block BmprIb at 5- to 10-fold higher concentrations (Yu et al., 2008a, 2008b). Low concentrations of both inhibitors were effective at blocking the activities of BMP6 directing either Msx1 or Lhx2 expression (Figure 8O,P). In contrast, it took 5 to 10-fold more of either inhibitor to block the activities of BMP4 (Figure 8P). These studies provide strong support for a model in which BmprIa mediates the activities of BMP6, while BmprIb mediates BMP4 signaling. Together, our in vivo and in vitro analyses demonstrate that different BMP ligands to act through distinct type I receptors to mediate their specific differentiation activities. We have methodically tested the ability of the dorsal complement of BMPs to direct dorsal spinal fates. The identity of BMPs present in the dorsal-most spinal cord differs between species. We have confirmed that BMP4 and BMP7, but not BMP5, BMP6 and GDF7, are present in the chicken dorsal spinal cord, whereas a larger complement of BMPs, including BMP5, BMP6, BMP7 and GDF7, but not BMP4, are present in the early mouse spinal cord. Using in vivo and in vitro approaches, we have shown that each BMP has a unique, species-specific range of cellular activities directing dorsal fates. We propose these activities result in a ‘mix and match’ code of BMP signaling specifying four classes of dorsal cell types (Figure 8Q–T). In this model, BMP6 (mouse) and BMP7 (chicken) are the most effective at directing RP identity through the BmprIa receptor (mouse) (Figure 8Q). Both BMP4 and BMP7 can promote dP1 patterning through BmprIa or BmprIb (chicken), but only BMP4 directs progenitors to differentiate as dI1s through BmprIb (mouse and chicken) (Figure 8R). BMP4 also specifically directs dI2 differentiation in chicken, thereby depleting the pool of dP2s (Figure 8S). All BMPs tested in both species, including BMP4, BMP5, BMP6 and BMP7, can act though either BmprIa or BmprIb to promote the dI3 fate (Figure 8T). Our studies also show that the BMPs do not direct the dI4-dI6 fates (Figure 2V and data not shown). While BMP7 can promote the dI1 and dI3 fate, we find no evidence that it also directs the dI5 fate as previously suggested (Le Dréau et al., 2012). Rather, these studies are consistent with our earlier finding that BMP signaling must be suppressed for the ventral-dorsal fates to be realized (Hazen et al., 2011). While BMPs clearly have distinct activities encoding dorsal fates, there is generally no single function for any particular BMP. Rather, each BMP can specify multiple dorsal cell types, while markedly differing in the effectiveness by which they induce a given fate. The range of cellular activities specified by BMPs appears to be evolutionarily conserved, but the specific identity of the BMP directing those cellular identities is not. For example, BMP7 and BMP6 have similar activities in chicken and mouse respectively, most prominently promoting RP formation. Similarly, BMP4 directs the dI2 fate in chicken, but mouse BMP4 does not. Thus the code of BMP signaling that directs dIN formation appears to be species specific. It should also be noted that our in vivo manipulations of BMP signaling were performed in a background of endogenous BMP signaling. While we found that misexpression of Bmps tended, if anything, to reduce the expression of the endogenous BMPs (chevrons, Figure 2—figure supplement 2C) suggesting that the ectopic BMP may overwhelm endogenous BMP signaling, it remains a caveat that we may be examining the additive effects of BMP signaling in the chicken experiments. The overlapping activities of the BMPs may explain why it has been challenging to dissect the signal-specific differences between the BMPs using loss-of-function approaches. For example, both BMP4 and BMP7 are required to specify the dI1s in chicken (Le Dréau et al., 2012). However, our sufficiency experiments have shown that BMP4 more effectively directs the dI1 fate than BMP7 (Figure 2V) and we have identified a mechanism to explain the difference between their activities (Figure 8R). In our model, both BMP7 and BMP4 can induce progenitors to become dP1s, but only BMP4 can direct progenitors to differentiate early as dI1s. Thus the larger increase in the dI1 population observed after Bmp4 electroporation may stem from BMP4’s ability to promote both dP1 patterning and dI1 differentiation (Figure 2V). In contrast, the smaller increase in the number of dI1s seen after Bmp7 electroporation may result from the ectopic dP1s being directed to differentiate by endogenous BMP4. We did identify two activities unique to BMPs: BMP7 drives the formation of the RP, and BMP4 can drive some progenitors, including the dP2s, to directly differentiate as dI2s in chicken. This latter activity is profound, leading to the depletion of dP2s (Figure 5O) and the formation of a large mass of Lhx1/5+ dI2-like cells (Figure 2—figure supplement 4D–F). The dI2s are also the only population that both expand and change location, becoming intermingled with/ventral to the dI3 population. Interestingly, we see this shift in location occurring between the 25 ng/μl and 50 ng/μl condition in the Bmp4 concentration series (data not shown). Thus, for 5 ng/μl and 25 ng/μl conditions, the dI2 population is larger following Bmp4 electroporation, but in the correct spatial order with respect to the dI1 and dI3s, i.e. midway between them. However, by the 50 ng/μl condition (which has >2 fold more dI2s than the 25 ng/μl, Figure 4J) the dI2s are now ventral to dI3s. It is possible that as the dP2 Ngn1+ domain is depleted, the more ventral Ngn1+ domain, that would normally give rise to ventral INs (Perez et al., 1999), is co-opted to make dI2s. 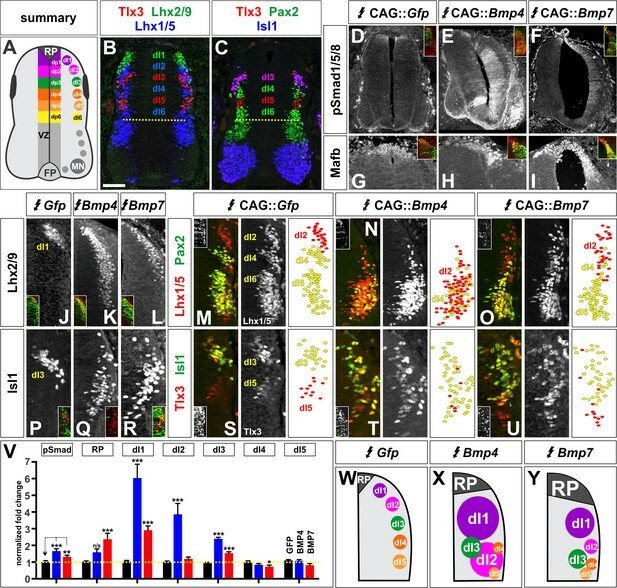 These findings suggest that the location of progenitors along the dorsal-ventral axis determines their response to BMP4: thus, the dorsal-most progenitors can receive both patterning and differentiation cues from BMP4, whereas BMP4 can only direct Ngn1+ progenitors to a dI2 fate. This result in turn suggests that HH stage 15 dorsal progenitors are not equivalently competent; rather they have been positionally subdivided by an earlier patterning event, perhaps mediated by Shh or retanoids. The defining characteristic of a morphogen is that it patterns cellular identity in a concentration-dependent manner. The BMPs have been widely assumed to pattern the dorsal spinal cord as a morphogen gradient by analogy with Shh signaling in the ventral spinal cord. Studies in Drosophila (Kwan et al., 2016; Bier and De Robertis, 2015), zebrafish (Tribulo et al., 2003; Tucker et al., 2008) and the developing telencephalon (Watanabe et al., 2016) have provided support that BMPs can act as morphogens. However, we found no evidence for this model in the spinal cord, either in our in vivo or in vitro studies. The spatial morphogen model predicts that the highest concentration of BMPs should specify dI1s, while a lower concentration specifies the dI2s or dI3s. We rather found that increasing the concentration of BMPs increased the efficiency by which they directed their range of cellular identities, rather than changing their identity. The temporal morphogen model predicts that prolonged exposure to BMPs dorsalizes neural fates over time. We found no evidence for this model in our in vitro studies with mouse cells (Figure 4—figure supplement 1). The situation in vivo is more nuanced. A previous study found that progenitors in HH stage 10 neural fold explants were progressively dorsalized when cultured with BMP4 (19). However, the competence of progenitors to respond to the BMPs appears to have changed by HH stage 15 (~12 hr later), our electroporation time point, and the period when BMP expression begins in the chicken spinal cord (Figure 1U–B’). By this later stage, dorsal and ventral-dorsal progenitors show differential competence in their ability to respond to BMP4. 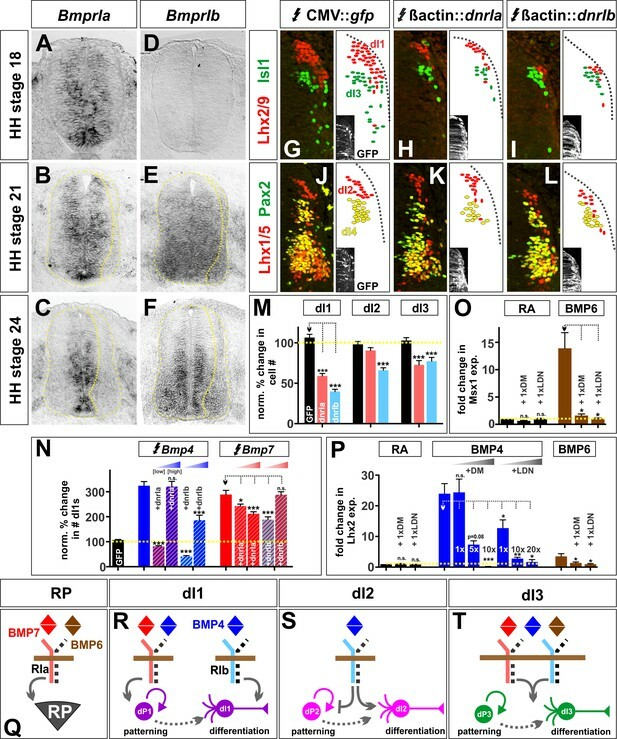 We find that while BMP4 can have prolonged, reiterative effects on progenitors, first patterning dorsal progenitors as dP1s, and then driving dI1 differentiation. However, underlying positional information in the dorsal-most spinal cord has already directed progenitors towards being competent to assume a dI1 or dI2 fate in response to BMP4. How widely will the BMP-signal-specific model be applicable? Many other organ systems require multiple BMPs for their development. For example, BMP2, BMP3, BMP4, BMP5 and BMP7 are expressed in the developing kidney (Godin et al., 1999). When two of these BMPs, BMP2 and BMP7, were assayed for their ability to induce renal branching, only BMP7 was sufficient to do so (Piscione et al., 1997). Similarly, many BMPs, including BMP2, BMP4 and BMP7, are expressed in the developing tooth (Aberg et al., 1997) and eye (Huang et al., 2015). In the skeletal system, only GDF6 (BMP13) and GDF7, and not BMP2, have the ability to induce tendon differentiation (Berasi et al., 2011). Thus, the presence of multiple BMPs in overlapping and/or adjacent locations is a general feature of organogenesis, making it feasible that BMPs will have signal-specific activities directing cell fate in other systems. Our studies suggest a model where BMPs mediate their signal-specific activities by activating distinct type I Bmprs in progenitors, to permit differential progression through the cell cycle. This model concurs with previous studies demonstrating that BmprIa and BmprIb translate distinct BMP activities during development. Biochemical studies have previously shown that different BMP ligands can bind to the type I Bmprs with different affinities (ten Dijke et al., 1994) perhaps driving distinct biological activities. In the early embryo, activation of BmprIa can promote progenitor proliferation while BmprIb drives differentiation and apoptosis (Panchision et al., 2001). Both BmprIa and BmprIb direct cell fate specification in the spinal cord (Timmer et al., 2002), but only BmprIb is required to translate the axon guidance activities of the BMPs (Yamauchi et al., 2008). This study refines our understanding of how the type I Bmprs direct dorsal spinal cell fate, by showing that BmprIa can translate the patterning activities of one set of BMPs (BMP5, BMP6, BMP7), while BmprIb promotes differentiation after activation by BMP4. The mechanisms by which activation of distinct BMP receptor complexes promote distinct effects are not known. The role of the Smad complex, the canonical second messenger for BMP signaling (Hegarty et al., 2013), remains unresolved. Our previous studies have demonstrated that Smad5 is the key Smad protein required for specification of cell fate (Hazen et al., 2012). Here, we show that each BMP can activate Smad1/5/8 to different levels, with BMP4 and BMP5 most effectively increasing pSmad1/5/8 (Figure 2E and Figure 2—figure supplement 1B). However, a specific level of pSmad5 does not appear to encode a specific cell fate, as predicted from the graded distribution of pSmad1/5/8 in the tissue immediately adjacent to the RP (Hazen et al., 2012) (Figure 2D). Thus, while the electroporation of both Bmp7 and [low] Bmp4 results in similarly low levels of pSmad1/5/8 (Figures 2F, V, 4B and J), these manipulations do not result in similar patterning activities and fate outcomes. Future studies will evaluate whether the type I Bmprs differentially regulate the ability of Smad5 to turn on the specific genes involved in neurogenesis and/or cell cycle control. Our studies support the model that an output of differential BMP signaling is the regulation of the cell cycle. There is precedence for this model: previous studies have shown that GDF11 (BMP11) can inhibit progenitor proliferation in the olfactory epithelium, (Wu et al., 2003; Wu and Hill, 2009) while it promotes cell cycle exit in the developing spinal cord (Shi and Liu, 2011). Thus, GDF11 regulates the cell cycle in a manner consistent with promoting differentiation. Similarly, BMP4, but not BMP7, can promote neurogenesis in the olfactory epithelium (Shou et al., 2000). We find that several BMPs, (BMP5, BMP7 and GDF7), have shared effects on progression through the cell cycle in the chicken, that are distinct from BMP4. Similarly, BMP4 and BMP6 administration to mESC cultures exerts distinct changes in the cell cycle, while other BMPs (BMP5, BMP7 and GDF7) have no effect. These experiments are complicated to interpret, but they are nonetheless consistent with a model in which BMP4 acts as a differentiation factor, prolonging the cell cycle, distinct from action of the patterning BMPs, BMP7 and BMP6 (Figures 6O, 7U and V). Further experiments are needed to assess whether this mechanism is causal, for example whether these alterations in the cell cycle direct patterning, or are themselves a consequence of a patterning activity. Finally, these studies have implications for the development of stem-cell replacement therapies to repair the spinal cord. The spinal cord is particularly vulnerable to injury, given the lack of functional redundancy with other structures. To date, significant progress has been made deriving ventral motor neurons from stem cells to permit the recovery of coordinated movement (Wichterle et al., 2002; Adams et al., 2015). However, relatively limited progress has been made generating the spinal sensory INs that integrate somatosensory information from the periphery and relay it to the brain. These studies advance that goal, by first, identifying the code by which the BMPs specify the dorsal-most sensory INs during development and then developing protocols to direct ESCs towards dorsal spinal fates. We have identified that BMP6 most effectively directs mESCs towards the RP, whereas BMP4 directs the dI1 fate, and a mixture of BMPs most effectively directs the dI3 fate (Figure 3, Figure 3—figure supplement 2). Future studies will determine whether BMP4, which is not expressed in the developing mammalian spinal cord, is nonetheless capable of generating stem cell derived dI1s that functionally mirror their endogenous counterparts. We will also continue to assess conditions to derive the dI2s. The identification of protocols to derive dI1s and dI3s in vitro have the potential to restore proprioception and pre-motor control (Lai et al., 2016). For effective expression in chicken embryos, mouse Bmp4, Bmp5, Bmp7 and Gdf7 inserts (Butler and Dodd, 2003) were subcloned in front of the CAG enhancer in the CAGGS-IRES-Gfp (pCIG) vector (Megason and McMahon, 2002). The CAG enhancer is comprised of a CMV enhancer and chicken β-actin promoter (Miyazaki et al., 1989). The Bmpr complex was inhibited by expressing dominant negative (dn) type I Bmprs under the control of the chicken β-actin promoter (Lim et al., 2005). In these constructs, the intracellular domain of the type I Bmpr was replaced with GFP. Fertile White Leghorn eggs (McIntyre Poultry and Fertile Eggs, Lakeside, CA) were incubated for 60 hr until the embryos developed to HH stages 14–15. The spinal cord was electroporated (Yamauchi et al., 2008) and then allowed to develop for 48 hr until HH stages 24–26. The following constructs were used: pCIG vector (1 μg/μl), CAG::Bmp4-IRES-Gfp (5 ng/μl, 25 ng/μl, 50 ng/μl or 500 ng/μl), CAG::Bmp7-IRES-Gfp (500 ng/μl), CAG::Gdf7-IRES-Gfp (500 ng/μl) and CAG::Bmp5-IRES-Gfp (500 ng/μl), β-actin:: dnBmprIa-Gfp (1 μg/μl) and β-actin::dnBmprIb-Gfp (1 μg/μl). Information about the expression plasmid concentration for each experiment can be found in Supplementary file 5. In all cases, the presence of GFP demonstrates the electroporation efficiency. To alter the concentration of Bmp expression: the CAG::Bmp4 expression vector was diluted with the pCIG vector, to hold the DNA concentration constant at 500 ng/μl across experiments. Bmp electroporation does not generally induce the expression of other Bmps. Rather, only the expression of the electroporated Bmp is upregulated (Figure 2—figure supplement 2). For the cell cycle experiments, a pulse of BrdU (5’-bromo-2’deoxyuridine) was added to chicken embryos 30 min prior to dissection (Warren et al., 2009). Note that the electroporation efficiency did vary slightly across experiments, resulting in some variation in the increases of cell numbers observed between experiments. However, the trend observed for the cell fate changes and the level of activation of pSmad1/5/8, the downstream effector of BMP signaling, is consistent for each BMP regardless of electroporation efficiency (Figure 2—figure supplement 3). High BMP concentration (>500 ng/μl), coupled with efficient electroporation could result in severe morphological changes, including the widening of the ventricle, thinning and elongating of the electroporated side of the spinal cord and the formation of a large tumorous ball of Lhx1/5+ cells in the ventral spinal cord (see Figure 2—figure supplement 4 for examples). The non-electroporated side of the spinal cord could not be used as the negative control in cell-counting experiments, because Bmp misexpression affected patterning on both sides of the spinal cord, most notably for the dP1 and dI1 populations (compare Figure 5H–J). Thus, the cell number on the electroporated side was normalized against a Gfp control electroporation performed at the same time. Similarly, in the cell cycle experiments, the number of BrdU+ cells was normalized to the area of the progenitor domain. Chicken embryonic spinal cords and mouse embryoid bodies (EBs) were thin-sectioned to yield 20 μm and 12 μm sections respectively. Antibodies against proteins were used for immunostaining and can be found in Supplementary file 1. Species appropriate Cyanine 3, 5 and Fluorescein conjugated secondary antibodies were used (Jackson ImmunoResearch Laboratories). Images were collected on Carl Zeiss LSM700 and LSM800 confocal microscopes. In situ hybridizations were performed on chicken (HH stage 14–26) and mouse (E9.5–10.5) embryonic spinal cords. 3’UTR probes were designed using http://primer3plus.com and verified for specificity to the gene of interest using http://www.ncbi.nlm.nih.gov/tools/primer-blast/. Chicken and mouse primer sequences used to make in situ hybridization probes can be found in Supplementary file 2 and 3 respectively. Probes were made using a DIG RNA labeling kit (Roche, Indiananapolis, Indiana). Images were collected on a Carl Zeiss AxioImager M2 fluorescence microscope with an Apotome attachment. MM13 mESCs (a gift from T. Jessell, Columbia University (Wichterle et al., 2002) which test negative for mycoplasma contamination) were grown on irradiated mouse embryonic fibroblasts and maintained in a proliferative state using Leukemia inhibitory factor in an embryonic stem cell media. mESCs were differentiated in suspension to form EBs (Wichterle et al., 2002). 1 μM retinoic acid (RA) was added to the media at day 1 of differentiation to direct cells toward a spinal neural identity (Muto et al., 1991). 24 hr later, BMP recombinant proteins (R and D Systems; Invitrogen) were added to the media to direct EBs toward a dorsal identity. Information about the concentration of recombinant proteins used in each experiment can be found in Supplementary file 5. EBs were collected at day nine for the concentration-comparison experiments, or every 3 days from day 0 to day 15 for the time-course experiments. EBs were either fixed with 4% PFA and processed for immunohistochemistry or RNA was extracted (Qiagen RNeasy kit) for qRT-PCR. For BrdU incorporation experiments BrdU was added to the media 2 hr prior to collection at day 9, then fixed with 4% PFA and processed for immunohistochemistry as before. Dorsomorphin and LDN-193189 (Stemgent) were used to inhibit BMP signaling. Low concentrations of Dorsomorphin (1 uM) have been shown to block both the activin type IA receptor (Acvr1 or Alk2) and BmprIa (Alk3), while higher concentrations of Dorsomorphin (10 uM) additionally block BmprIb (Alk6) (Yu et al., 2008b). Similarly low concentrations of LDN-193189 (100 nM) block only Acvr1 and BmprIa, while higher concentrations (500 nM) also block BmprIb, activin type IB receptor (Acvr1B or Alk4), TGFβ receptor 1 (Tgfbr1 or Alk5) and activin type IB receptor (Acvr1C or Alk7) (Yu et al., 2008a). We assessed whether either the timing of RA and BMP addition, or manipulation of the Wnt and Shh signaling pathways, improved our ability to produce more dorsally directed EBs. However, modifying the timing of RA and BMP addition had no effect on axial level or progenitor/IN identity (Figure 3—figure supplement 1A–B). Similarly, neither altering Wnt signaling nor inhibiting Shh signaling had an effect on the efficiency of dorsal IN differentiation (Figure 3—figure supplement 1A). RNA collected from EBs was reverse transcribed to make cDNA (Superscript III kit, Invitrogen). cDNA was analyzed for gene expression using quantitative (q) PCR. qPCR was performed on a Roche 480 Lightcycler using Roche enzymatic reagents (SYBR green I Master mix). Primers were designed using the qPCR setting on http://primer3plus.com and verified for specificity using http://www.ncbi.nlm.nih.gov/tools/primer-blast/. Relative fold change in expression was calculated using the 2(-ΔΔC(T)) method (Livak and Schmittgen, 2001) comparing the gene of interest to the control housekeeping gene, Glyceraldehyde 3-phosphate dehydrogenase (GapDH). Biological replicates: dozens of EBs within a treatment group were collected for RNA extraction during each experiment; at least 2 independently cultured wells of EBs were collected to make 2 samples of RNA per group. Complete mESC differentiation experiment were repeated two or more times. Technical replicates: at least two cDNA reactions were performed per RNA sample; cDNA samples were run in triplicate and qPCR was performed on each cDNA sample at least twice. All statistical analyses were performed using a two-tailed Student’s t-test. Primer sequences can be found in Supplementary file 4. Current Opinion in Neurobiology 11:43–49. Philosophical Transactions of the Royal Society B: Biological Sciences 363:57–70. Bioorganic & Medicinal Chemistry Letters 18:4388–4392. Journal of Experimental Medicine 112:509–531. The International Journal of Developmental Biology 43:405–411. Journal of Biological Chemistry 274:25543–25549. The American journal of physiology 273:F961–975. The Journal of Biological Chemistry 269:16985–16988. Current protocols in stem cell biology Chapter 1:Unit 1H -H 9. Thank you for submitting your work entitled "BMPs direct sensory interneuron identity in the developing spinal cord using signal-specific not morphogenic activities" for consideration by eLife. Your article has been reviewed by three peer reviewers, and the evaluation has been overseen by Marianne Bronner as Senior Editor. The reviewers have elected to remain anonymous. Our decision has been reached after extensive consultation between the reviewers. Based on these discussions and the individual reviews, we regret to inform you that your work will not be considered further for publication in eLife. You will see that all three reviewers see merit in the work but also raise considerable concerns that will require a good deal of additional work to address. Specifically, the reviewers agreed that it is important to address how BMPs are directing neuronal diversity. However, they all felt that it would take substantial new experiments with different concentrations of BMPs in the chick system, as well as providing evidence for the different concentrations, to satisfy their concerns. Also, the effects on cell cycle need to be more convincing. We hope that you find the detailed comments of the reviewers below helpful in revising the paper. Here the authors address the question as to how BMPs operate to generate specific populations of dorsal interneurons in the developing spinal cord. Current models suggest that BMPs act as classical morphogens that direct progenitor patterning and subsequent neuronal fates through graded signals; however definitive evidence for this model is lacking. Here the authors aim to distinguish whether BMPs are indeed morphogens in this capacity or conversely, have defined and specific functions in directing progenitor patterning and neuronal differentiation. This is an interesting question and would provide new insight into the function of BMPs in patterning. The experiments that directly test the central hypothesis utilize two systems, in ovo electroporation in chick spinal cords and differentiated mouse embryonic stem cells. The strength of the in vitro cultures is that the concentration of BMPs can be carefully titrated and effects on dorsal interneuron (dI) generation can be evaluated (much like the original experiments testing effects of Shh on ventral neuron specification). The result that distinct BMPs have specific roles in dI generation that appears independent of concentration is convincing in the culture system (Figure 3 and 4). Unfortunately, the chick experiments are problematic. First, the chick experiments are performed in the context of gradients of endogenous BMP proteins, complicating interpretation of the effects of exogenous BMP overexpression (how exogenous BMPs affect endogenous gradients and signal transduction is not discussed and not determined here. Authors state in the Materials and methods that BMP electroporation does not generally induce expression of other BMPs, but does this apply to all BMPs? What happens to gradients?). Insets shown in Figure 2 show amount of transfection read out by GFP (I assume), and these images show quite a lot of variation in transfection efficiency. Given that the amount of transfection will dictate levels of ligand, how do the authors control for transfection efficiency and rule out the possibility that outcomes are a consequence of differential levels of expression? The key experiment to manipulate levels of BMPs through electroporation consists of electroporating two different amounts of expression plasmid (Figure 4). It is not clear how the authors controlled for transfection efficiency, which would directly affect the amount of BMPs generated in the embryo. The amounts of plasmid transfected are also not clear: the text reads that the lower BMP condition consists of a "1:9 mixture of CAG::gfp and CAG::BMP vectors", which implies 90% of the "high" concentration. However, the Materials and methods section suggests the reverse i.e. 9:1, which would be 10% of the high concentration. Nevertheless, in the best case scenario, the authors are addressing two concentrations of BMP termed "high" and "low" (40% and 15% of pSMAD signal output) and both lead to the same effect but with different efficiencies. The authors interpret this to mean that BMPs do not act as a morphogen in this context. An alternative interpretation is that these two concentrations have the same operational output and that going lower might have different outcomes. It seems important for the authors to test a range of amounts before arriving at this conclusion. I agree that the mouse cultures support their interpretation but, different BMPs are utilized in the mouse compared with chick, and as such mouse BMPs could have different modes of function during patterning and differentiation. A second issue in this study is the study of cell-cycle dynamics. The authors state that a patterning factor might speed up cell-cycle transitions, but this does not have to be the case. The authors measure BrdU incorporation in specific progenitor domains after electroporation of BMPs. They argue that BMP4 and BMP7 have differential effects on proliferation according to different domains. However, the authors show that treatment with BMPs can have dramatic consequences on expanding or almost eradicating these same progenitor domains (outlines in Figure 6 show this clearly). Clearly, these expansions and reductions need to be taken into account to avoid skewing the BrdU counts. However, it is not clear how the counts were done. This is important to know. The authors make some strong statements about BMPs regulating cell-cycle length and cell-cycle exit, and use these conclusions as basis for their ideas on mechanism. However, supporting evidence is weak. While changes in BrdU+ cells or pH3+ cells are suggestive of changes in cell-cycle length/exit, it is important to measure both directly. This is difficult to do in the chick system (due to the closed environs of the egg-but perhaps can be addressed in NEW cultures) but can be done in mice. This is likely to be outside the scope of the current study, but it forms an essential part of the authors' argument. Without this, the models drawn in Figure 7 are an overstatement (also, did not see evidence in this study that BMPr1a is involved in roof plate formation – Figure 7O). Finally, it is hard to draw parallels between the chick studies and the differentiated EBs in culture in order to gain insight into the question of how BMPs function (morphogen or role-specific) because of involvement of distinct BMPs in the different species. The chick experiments point to overlapping/functions of BMP4 and BMP7 in many instances, so it is hard to make the point that they have specific roles in patterning and dI development. The culture system seems to be a better starting point to address this question. This study challenges the dogma that BMP gradients/concentrations and/or temporal characteristics of exposure specify the dorsal neural tube neuronal populations, particularly dI1-dI3. 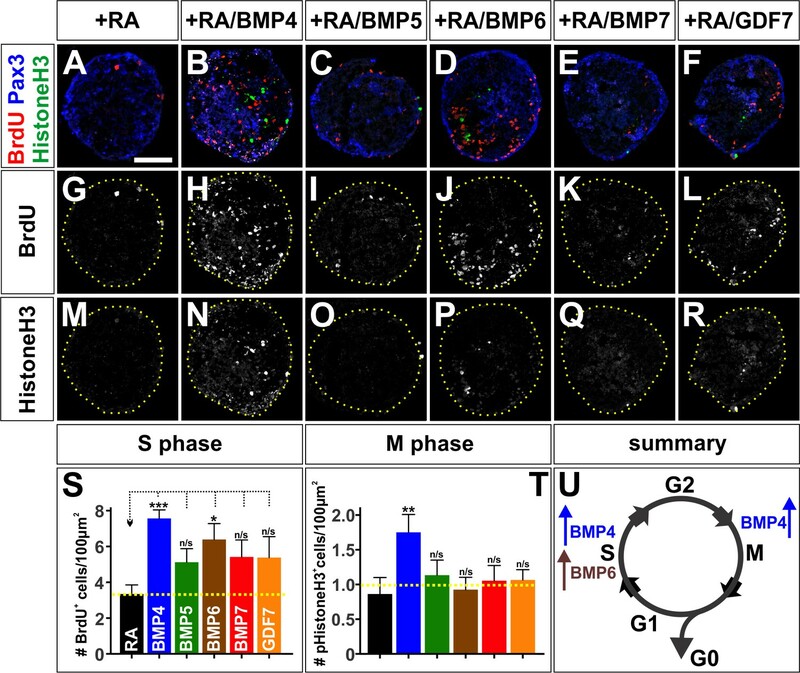 Using the chick neural tube and comparisons with mouse ES cells, they show distinct functions for BMP4, 5, 6, 7 and GDF7, particularly highlighting BMP4 and BMP7. These BMPs have different effects on the cell cycle of progenitors, the expression of bHLH factors that define the progenitors, and the dI populations that arise from these progenitors. Differences in use of BMPs in mouse and chick are identified. For the most part, the results support the conclusions. I have suggestions on clearing up some inconsistencies in presentation. Also, the results showing the effect of the BMPs on the cell cycle are not strong so conclusions should be tempered or better experiments performed. 1) I have a problem with Figure 4D-J where 2 concentrations of expression plasmid for BMP4 are being tested in the chick electroporation assay. Here, rather than cell number (as is the norm and is used in Figure 2), they quantify the data by fluorescence intensity. This is particularly a problem for the dI2 population that is identified by expression of Lhx1/5 but an absence of Pax2. Is the intensity from the Pax2+ cells subtracted out from the Lhx1/5 signal? This is not clear. Furthermore, from the image (Figure 4I), it looks like Pax2 is suppressed (loss of dI4), thus leading to more cells defined as dI2-but are they really? This needs clarification for why change the quantification (cell number is best here I believe), and how to interpret the loss of dI4. 2) Measuring the length of the progenitor domain based on the in situs for Atoh1, Ngn1 and Ascl1 are questionable. It may be fine for Atoh1 (clear increase with BMPs), and Ngn1 (striking loss with BMP4), but the Ascl1 is not convincing. If anything it looks like the domain is shifted down, not necessarily expanded. This is also pretty crude given the morphological disruption of the neural tube seen. More caution in concluding anything from this is suggested. This also affects the BrdU experiment where the in situ is used to highlight the particular progenitor domain. This is not very accurate. Really need double immuno for the progenitor markers and BrdU, which is technically challenging. With this in mind, the cell cycle conclusions are not compelling. 3) No effort to show what levels of BMP4 or BMP7 are attained in the chick electroporation assays. Authors need to show if they are expressed at comparable levels when the same amount of plasmid is used given conclusions are being made about specificity of activity not concentration being important. For the in vitro data this is not a question since the BMPs themselves are added to the media at defined concentrations. 4) Some discussion of what has been done in the BMP field to match ligands with receptors-has anything been done? This concept that the different BMPs have specificity for receptors is reported. More reference to what has been done in the field along these lines seem relevant. Also, there is a whole literature on BMP gradients specifying cell type in zebrafish. Is there just a difference is species or has it not been addressed in experiments in fish. Work from Mary Mullins comes to mind. The main crux of this study is that different BMPs act differentially to direct dorsal progenitor and interneuron identity and do not act as a set of classical morphogens, working through concentration and time to progenitor lineage restriction and specify cell fate. The data seem reasonable for a differential effect on interneuron identity but I wasn't so convinced by the effects on progenitor identity. I also wonder whether a slightly different statistical analysis might not tease things out better and make the discussion easier- namely something like the Kolmagorov-Smirnov test of differences in distribution. My understanding is that different BMPs should have differing distributions of effects on the different dorsal interneuron populations and so an analysis of these distribution- rather than a direct comparison of one cell type by different BMPs might be a better way to go forward. I go through each figure in turn with comments. Figure 1. This seems completely reasonable in terms of an analysis of gene expression at different stages in the chick. Figure 2. I was slightly puzzled by the upregulation of phospho smad on the contralateral hemi-spinal cord with BMP4 electroporation in E.
I wasn't sure of how the authors distinguished dI4 from dI6 in their summary between N and O- indeed there is no mention of dI6 in the quantitation shown in V. Could it be possible that there is a dramatic reduction in dI6 with BMP4 or a dramatic increase in dI4 with BMP7? The results for dI3 and 5 look convincing. I did notice that the spatial organisation of these distinct interneurons also seemed perturbed- so not just number but position could also be altered by changing BMP expression. In V- I wonder if an analysis of the distribution of interneuron identities following the different perturbations might be informative- i.e. is the distribution of RP and dorsal interneuron types changed differentially by BMP4 and BMP7 or are both distributions similar? Figure 3 shows quantitation of RT q-PCR results on embryoid bodies treated with different BMPs suggesting that BMP4 upregulates dI1 markers preferentially, in comparison to the other BMP family members. This data looks convincing and the distributions (see above) look clearly different. I do wonder whether RT-1-PCR is the best measure of this though- rather than the protein expression (cellular) analysis shown in other parts of the paper. Figure 4. Here- changes to concentration of plasmids electroporated are used as a proxy for changes in BMP concentration. This assays, quite rightly, by phospho SMAD expression. It would be nice to see some kind of quantitation of the effects of the different plasmid concentrations on SMAD expression. Again, the distributions of dorsal interneuron identities generated by these different perturbations do look different but it might be nice to do this direct comparison through the same concentration of plasmid across the different interneuron types to see if the different concentrations display the same distributions. Figure 5. Here- I wasn't really sure on the differences in progenitor characteristic and identity that were being displayed. The progenitor domains seemed the same, in terms of their distributions following BMP4 and BMP7 misexpression but I might be missing something subtle here. Figure 6. I wonder if different pulse-lengths of BrdU might be informative to look at changes in cell cycle following different BMP exposures. Finally, in Figure 7 – I wasn't clear on the expression of the BMPR1b in the dorsal spinal cord early in development. Is it expressed in the right time and right place to mediate differential signalling dependent on the BMP being exposed in the wild-type. Thank you for resubmitting your work entitled "BMPs direct sensory interneuron identity in the developing spinal cord using signal-specific not morphogenic activities" for further consideration at eLife. Your revised article has been favorably evaluated by Marianne Bronner as Senior and Reviewing editor, and three reviewers. The manuscript has been improved but there are some remaining issues that need to be addressed before acceptance, as outlined below. Although two of the reviewers are completely satisfied, reviewer 3 requested more experiments. I've included the full review below for your information. However, after discussion between the reviewers, it was agreed that textual changes would be sufficient to address their concerns. The authors should resist from making firm conclusions about the length of the cell-cycle and the ability to promote exit from the cell-cycle, and should tone down the text regarding these points. They should also remove Figure 6O and Figure 7 U and V as these models are misleading. The models in Figure 8 is a problem, but as long as the text tones down the cell-cycle effects and states that other experiments are needed when discussing the final over-arching model, it will be OK. The authors have provided a revised version of their manuscript including new data that address concerns regarding the chick electroporation experiments. Specifically, they include tests of a broader concentration of plasmids expressing BMP4, and focus more on cell-cycle experiments in the mouse in vitro system. The additional experiments for the mouse system complement the mouse analyses and lend further support to the investigators findings. As mentioned in the earlier review, the observations that the investigators perform in the mouse system are solid and support their hypothesis that BMPs in this paradigm, do not function as simple morphogens. However, the experiments in the chick still remain a problem. The investigators confirm in the text and in their response letter that the chick and mouse system are indeed different (see response point 2) and that there are caveats to the in vivo experiments. I am not sure how expanding the mouse experiments helps assuage the problems with the chick. Overall, while the manuscript is improved, the core issues that I had with the initial submission have not been fully addressed, and there are sufficient discrepancies within the revised version that dampen enthusiasm. 1) The authors include a nice array of plasmid concentrations to evaluate the effects of BMP4; but the question about the effects on endogenous BMPs remain. The authors show that BMP transcription is not changed, but there is no demonstration that endogenous BMP protein gradients are not altered upon BMP overexpression. 2) The authors talk about fate changes in response to BMPs- I am wary of the use of this term in this context because the authors show that BMPs affect cell-cycle. The observations of increased dI numbers in response to BMPs could be explained by proliferative changes within individual domains. I agree that there is an expansion of the di1 and dI3 domains, but this could also be due to proliferation and not fate. The reason that I am wary of the use of the word "fate" or "specify" is that if there were indeed a fate change, then one would expect reductions in neighboring populations but the amounts of the neighboring IN populations are either increased or remain largely the same. I would welcome some clarification of this point. 3) The cell-cycle studies are still very problematic. I still think that the chick experiments are over-interpreted (see the model in Figure 6) without more detailed experiments. In the chick, BMP4 expression causes no change in S-phase cell numbers and increased numbers of cells in M-phase-the authors interpret this as increased number of dividing cells with increased propensity for cell-cycle exit. I am not sure why they bring in the cell-cycle exit affect: there is no change in progenitor:neuron ratio as stated by the authors, and morphological changes elicited are consistent with increased proliferation. I have reservations about the model as it suggests that BMP4 promotes neural differentiation, when there is no evidence for this. Could all be explained by increased proliferation and normal exit of cell-cycle. Further, expression of BMP7 causes reduced numbers of cells in S-phase and increased M phase- there is no real basis here to conclude that the cell-cycle is shortened simply by the increased numbers of cells in M-phase; it is a good first observation but really warrants further analysis to obtain a firm conclusion. The authors approach for deeper validation of the chick studies is to repeat the cell-cycle experiments in the mouse system, but as mentioned previously in the original review, this is a vastly different system, and different BMPs are in play. Speaking to this point, the results in the mouse system appear different from the chick experiments. In the mouse system, BMP4 causes a marked increase in the numbers of S phase cells (not seen in chick) and also M-phase cells-suggesting increased proliferation, and not supporting the increased propensity for cell-cycle exit suggested by the authors for the chick. BMP6 (they hypothesize that this is equivalent to BMP7 in chick) in this system now only increases cells in S-phase (not a reduction as they see in chick) and no change in M-phase cells (they see an increase in the chick). Some possibilities to consider are 1. BMP6 in the mouse is not the BMP7 homologue as the authors put forward; 2. It is the BMP7 homologue and the effects are simply different. The authors state in the text that their in vitro studies are consistent with the in vivo studies. While I agree that BMP addition in the mouse system does indeed alter cell-cycle dynamics, there are significant differences that could have different functional outcomes. These differences underscore the difficulty in extrapolating from the chick to the mouse in vitro system. Figure 4J: a more complete series of BMP concentrations which demonstrates more convincingly that while higher [BMP4] are more efficient in directing cell fate, all [Bmp4] direct the same range of cellular effects. Figure 7 (new): New mESC studies, which demonstrate that the BMP4 and BMP6 also have distinct effects on the cell cycle in vitro. Supplementary file 5: a detailed description of all the BMP concentrations tested in the studies. The experiments that directly test the central hypothesis utilize two systems, in ovo electroporation in chick spinal cords and differentiated mouse embryonic stem cells. The strength of the in vitro cultures is that the concentration of BMPs can be carefully titrated and effects on dorsal interneuron (dI) generation can be evaluated (much like the original experiments testing effects of Shh on ventral neuron specification). The result that distinct BMPs have specific roles in dI generation that appears independent of concentration is convincing in the culture system (Figure 3 and 4). Unfortunately, the chick experiments are problematic. First, the chick experiments are performed in the context of gradients of endogenous BMP proteins, complicating interpretation of the effects of exogenous BMP overexpression (how exogenous BMPs affect endogenous gradients and signal transduction is not discussed and not determined here. Authors state in the Materials and methods that BMP electroporation does not generally induce expression of other BMPs, but does this apply to all BMPs? What happens to gradients?). We agree with the reviewer that the chicken experiments are problematic for precisely the reasons they lay out, i.e. that they are performed in a background of endogenous BMP signalling. This is why we couple our in vivostudies with an in vitro approach, where it is possible to more carefully control manipulating BMP signalling. We have included a more substantive discussion of these issues in the Discussion subsection “BMPs have distinct roles directing dorsal spinal fates. a) The distribution of the endogenously expressed Bmp is not altered following in ovo electroporation of a different ectopic Bmp. Thus, Bmp7 expression is not upregulated in the presence of ectopic Bmp4 and vice versa. This result suggests that the phenotype observed we see are largely (solely?) a consequence of the ectopic Bmp. We now include this data in Figure 2—figure supplement 2.
b) We find that Bmp misexpression drives pSmad1/5/8 to a specific level throughout the spinal cord, consistent with the model that the ectopically expressed Bmp “overwhelms” endogenous BMP signalling. As a side note: we find it interesting that a given level of pSmad is not tuned to a specific cellular identity, rather low [BMP4] → low pSmad results in a different series of cellular fates than high [BMP7] → low pSmad. c) There are substantial commonalities in the mechanism in the in vivo and in vitro – that BMPs direct a specific range of cell fates (in the presence or absence of endogenous signalling), they differentially affect progression through the cell cycle and that these fates are mediated by different type I Bmprs. Insets shown in Figure 2 show amount of transfection read out by GFP (I assume), and these images show quite a lot of variation in transfection efficiency. Given that the amount of transfection will dictate levels of ligand, how do the authors control for transfection efficiency and rule out the possibility that outcomes are a consequence of differential levels of expression? The reviewer is correct that there is some variation in the electroporation efficiency, although it is generally easiest to get high levels of electroporation in the dorsal spinal cord. Nonetheless the exact identity of the electroporated cells will differ embryo to embryo. This stochasticity can be of concern when manipulating autonomously required signalling pathways. However, here we are examining the consequence of manipulating the levels of a diffusible ligand, i.e. it acts non-autonomously. We can see those non-autonomous effects very clearly i.e. the ability of the Bmps to influence the non-electroporated side of the spinal cord. Thus, the identity of the source cells is probably not that important, rather what is critical is the absolute level of ligand that directs the efficiency of the response. To demonstrate this more clearly we have included a Figure 2—figure supplement 3, which shows that we get similarly uniform levels of pSmad1/5/8 even with different patterns of Bmp electroporation. The absolute level of the ligand will, of course, also vary embryo to embryo, however the trend across years of experiments on this project is clear and unvarying – if high levels of a given Bmp are electroporated, we get more cells adopting the same range of cellular fates. The new data in Figure 4J speaks to this point, when we increase the level of electroporated Bmp4, we progressively increase the level of Smad signaling and concomitantly the number of cells that adopt dI1, dI2 and dI3 fates. The range of cellular fates does not change as the ligand concentration changes as would be predicted by the canonical morphogen model. […] The amounts of plasmid transfected are also not clear: the text reads that the lower BMP condition consists of a "1:9 mixture of CAG::gfp and CAG::BMP vectors", which implies 90% of the "high" concentration. We apologize for this typographical error, which has now been corrected in the text. However, the Materials and methods section suggests the reverse i.e. 9:1, which would be 10% of the high concentration. Nevertheless, in the best case scenario, the authors are addressing two concentrations of BMP termed "high" and "low" (40% and 15% of pSMAD signal output) and both lead to the same effect but with different efficiencies. The authors interpret this to mean that BMPs do not act as a morphogen in this context. An alternative interpretation is that these two concentrations have the same operational output and that going lower might have different outcomes. It seems important for the authors to test a range of amounts before arriving at this conclusion. We thank the reviewer for suggesting this experiment. As described in the Results section, we have now examined a wider concentration range i.e. 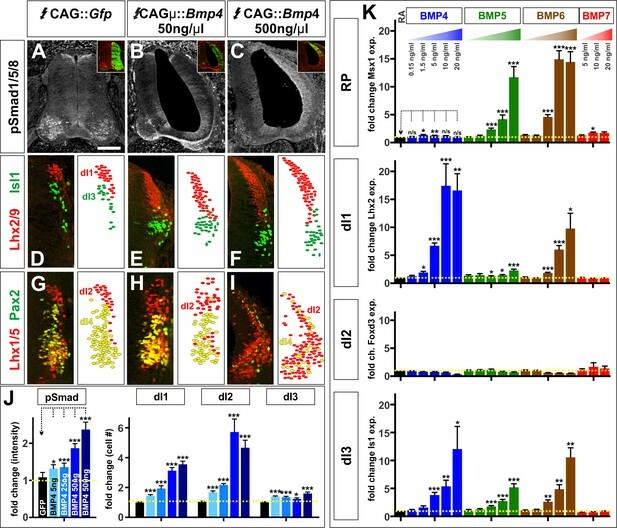 a 99:1 ratio of CAG::Gfp: CAG::Bmp4, 19:1, 9:1 and 100% CAG::Bmp4. The data is shown in Figure 4J, and strongly supports our hypothesis: this concentration range resulted in a relatively linear increase in Smad1/5/8 activity and an increase in same range of cellular fates. Thus, lower levels of BMP4 did not promote a more ventral-dorsal identity as predicted by the morphogen models. Rather, concentration appears to control the efficiency by which BMP4 can direct the same range of cell fates. I agree that the mouse cultures support their interpretation but, different BMPs are utilized in the mouse compared with chick, and as such mouse BMPs could have different modes of function during patterning and differentiation. Reviewer 1 is correct, and indeed we think that it is likely that there are species-specific differences in the code of BMP activities that direct cell fates. However, the common themes are also important: that BMPs direct a specific ranges of cell fates, they differentially affect the cell cycle and appear to function through specific type I Bmprs to mediate specific fates. We have added more discussion on this point in the Discussion section. A second issue in this study is the study of cell-cycle dynamics. The authors state that a patterning factor might speed up cell-cycle transitions, but this does not have to be the case. The authors measure BrdU incorporation in specific progenitor domains after electroporation of BMPs. They argue that BMP4 and BMP7 have differential effects on proliferation according to different domains. However, the authors show that treatment with BMPs can have dramatic consequences on expanding or almost eradicating these same progenitor domains (outlines in Figure 6 show this clearly). Clearly, these expansions and reductions need to be taken into account to avoid skewing the BrdU counts. However, it is not clear how the counts were done. This is important to know. We apologize for not clearly describing how these experiments were quantified. We normalized the BrdU+ cell counts to the area of the progenitor domain. This normalization was necessary as reviewer 1 correctly points out, because Bmps have such profound effects on the size of the progenitor domains. We have added more detailed information to the Materials and methods for readers to better assess how the quantification was performed. The authors make some strong statements about BMPs regulating cell-cycle length and cell-cycle exit, and use these conclusions as basis for their ideas on mechanism. However, supporting evidence is weak. While changes in BrdU+ cells or pH3+ cells are suggestive of changes in cell-cycle length/exit, it is important to measure both directly. This is difficult to do in the chick system (due to the closed environs of the egg-but perhaps can be addressed in NEW cultures) but can be done in mice. This is likely to be outside the scope of the current study, but it forms an essential part of the authors' argument. Without this, the models drawn in Figure 7 are an overstatement. We have added an additional analysis to these studies – new Figure 7 – examining the effect of the different BMPs on the cell cycle in our mESC cultures. The results are striking – there are ~2-fold more dividing cells (both M and S phase) in BMP4-treated cultures, while BMP6 alone of the rest of the BMPs, modestly upregulates the number of cells in S phase. Thus, BMPs have distinct effects on the cell cycle bothin vivo and in vitro. We have clarified in the text in subsection “Different BMP signaling components mediate the ability of the BMPs to promote patterning or differentiation” that this – the differential effect of the BMPs on cell cycle progression – is the most circumspect interpretation of our data. Also, did not see evidence in this study that BMPr1a is involved in roof plate formation-Figure 7O. This experiment was performed in the mESC culture system. We showed that with low concentrations of either BMP inhibitor, i.e. when we are blocking BmprIa, there is a significant reduction in the ability of BMP6 to direct EBs to express a RP marker (Msx1). As discussed in point 2 and 6 above, we have added more discussion about the interpretations of our chicken results in the Discussion section. We thank the reviewer for their support. In response to their concerns, we have performed a major new experiment: we have assessed the effect of the different BMPs on the cell cycle in our mESC cultures (new Figure 7). We monitored our RA, BMP4, BMP5, BMP6, BMP7 and GDF7 treated cultures for both BrdU incorporation and pHistoneH3 staining. As discussed above, we find that there are ~2-fold more dividing cells (both S and M phase) in BMP4-treated cultures compared to RA control. In contrast, BMP6, alone of the rest of the BMPs, modestly increases the number of cells in S phase. Thus, similar to our results in vivo, BMP4 has the most profound effect on the cell cycle, with BMP6 being the other active BMP (c.f. BMP7 in chick). As requested, we have also tempered our conclusions to clarify the key point: that the BMPs have different activities promoting cell cycle progression. How these differential effects on the cell cycle results in the specification of cell fate will require further study. One possibility will be to dissect how the activities of BMPs change over time, with respect to the cell cycle, using our in vitro mESC cultures. Do BMPs have differentiation effects as the commitment status of the cells change? We apologize for the misunderstanding. The previous graph in Figure 4 had two y-axes, one side was measuring cell number (which is the correct measurement as reviewer 2 points out) and the side was measuring the fluorescence intensity of pSmad. We recognize how confusing that was and have separated the graphs to make it clear to the reader what we are quantifying. We have now substituted the quantifications of area of these progenitor domains in Figure 5, instead of length. The result remains the same. Reviewer 2 is correct that the effect of Bmp misexpression on the Ascl1 domain is smaller than with the other two domains – however it is nonetheless a significant one. The Ascl1 domain is both slightly larger and shifted down – we have made the magnitude of the effect clearer in subsection “BMP4 and BMP7 have differential effects on dorsal progenitor identity in vivo” of the Results. The BrdU experiment was indeed technically challenging, note that we usedin situ hybridisation experiments to define the boundary of the progenitor domain, so we could then normalize the results with respect to area. As discussed above – we have added a further cell cycle experiment, using our in vitro approach – which show that BMP4 results in marked differences in the numbers of cells in mitosis compared to control. We have also now been more cautious discussing the cell cycle experiments. This question is surprisingly difficult to address given the stochastic nature of in ovo electroporation. We have tried using the BRE reporters of BMP activity, but found them to be inconsistent in our control experiments i.e. there is sufficient noise in the controls, that it is hard to distinguish the “real” effects of ectopic BMP expression. However, we have no concern that high levels of BMP expression are being achieved in both cases, because of the profound – but very different! – effects that high concentrations of each expression plasmid have on the morphology of the embryos. i.e. our results can not be explained by Bmp7 always being expressed at lower levels than Bmp4 (or vice versa). Additionally, as commented in above, we have now included an additional supplemental figure (Figure 2—figure supplement 3) that shows that how different patterns of Bmp4 misexpression nonetheless drive pSmad1/5/8 to a specific level throughout the spinal cord. This series of experiments also shows that similar level of pSmad driven by different Bmps does not result in the same cellular identity, i.e. low [BMP4] → low pSmad results in a different series of cellular fates than high [BMP7] → low pSmad. a) We have added references to the classic biochemical studies that suggested that BMPs have differential binding affinities to type I BMP receptors and included references from the Mullins lab in the Discussion. b) As commented previously, we think it an interesting and likely possibility that the “code” of BMPs used to specify cell type will differ – slightly? profoundly? – in different species. This question requires further study and is discussed further in the first paragraph of the Discussion. We also discuss that we can only currently make a case about the role of BMPs in the context of spinal cord development – not about their activity in development of other species/organ systems. However, we note that was the spinal cord was one of the systems that supported the canonical views that the BMPs act as morphogens – more by analogy with Shh than by observation – making it critical to reassess how strong the evidence is that BMPs act as morphogens in other systems. The data seem reasonable for a differential effect on interneuron identity but I wasn't so convinced by the effects on progenitor identity. I also wonder whether a slightly different statistical analysis might not tease things out better and make the discussion easier- namely something like the Kolmagorov-Smirnov test of differences in distribution. My understanding is that different BMPs should have differing distributions of effects on the different dorsal interneuron populations and so an analysis of these distribution- rather than a direct comparison of one cell type by different BMPs might be a better way to go forward. We thank reviewer 3 for this suggestion. As they note, the KS test is designed to examine whether there are differences in the manner in which experimental values are distributed, i.e. could two sets of numbers be taken from the same distribution (or not)? However, in general for our studies, it was more appropriate to determine the probability that the number of a particular class of cells, or level of gene expression, in our experimental conditions were similar to control. In these tests, we assume equal variance because the experiments are performed under very similar conditions. Supporting this assumption, it made very little difference to the p values when we relaxed the equal variance assumption using the Welch-Satterthwaite approximation. We also tested for a normal distribution according to the Anderson-Darling test. Where the data fit a normal distribution, we used the t-test; where it did not, we used a Mann-Whitney test. However, we were interested to assess whether we could determine whether Bmp4 and Bmp7 misexpression result in statistically similar (or not) range of cellular activities. We used the Fisher exact test on a 6x2 table, rather than the KS test, because the categories that we are assessing “# of RP cells, dI1s, dI2s, dI3s, dI4s, dI5” are indivisible biological entities not forming a ranked scale and are thus far from the continuous parameter required by the KS test. We found that the probability that cellular activities that result from Bmp4 and Bmp7 misexpression are from the same distribution is p< 0.0002. This analysis has been added to the figure legend of Figure 2 and further details added to the Materials and methods. We have considerable evidence that the effect of Bmp misexpression is non-automonous and is not confined to the electroporation side of the spinal cord. Thus, we think that the upregulation of pSmad on non-electroporated side is a result of diffusion of the ectopic BMP4 ligand. I wasn't sure of how the authors distinguished dI4 from dI6 in their summary between N and O- indeed there is no mention of dI6 in the quantitation shown in V. Could it be possible that there is a dramatic reduction in dI6 with BMP4 or a dramatic increase in dI4 with BMP7? This possibility is unlikely. While the images in Figure 2 might suggest that we used the spatial separation of the Pax2+ dI4 population from Pax2+ dI6 population to distinguish these cell types, in fact we also co-stained with antibodies against Bhlhb5, which labels a number of spinal cell types including the dI6s, but not the dI4s. Thus, the Pax2+ Lhx1/5- Bhlhb5- dI4s could be unambiguously distinguished from the Pax2- Lhx1/5+ Bhlhb5- dI2s and the Pax2+ Lhx1/5+ Bhlhb5+ dI6s. We are thus confident that there is no ambiguity in our cell count for dI4s and have clarified this issue in the legend to Figure 2. However, we were concerned about ambiguity in our dI6 count since Pax2+ Lhx1/5+ Bhlhb5+ does not uniquely distinguish the dI6s; this is why we did not include any dI6 counts. There is unfortunately no unambiguous marker in chicken that would distinguish the dI6s – antibodies against Wt1 for example only work in mouse. The results for dI3 and 5 look convincing. I did notice that the spatial organisation of these distinct interneurons also seemed perturbed- so not just number but position could also be altered by changing BMP expression. RP, dI1 and dI3 populations: for both the Bmp4 and Bmp7 electroporations, these populations expand but remain in the correct spatial order with respect to each other. Thus, the RP remains the most dorsal population, the dI1 is ventral to RP and the dI3s are ventral to the dI1s. dI2 population: For the Bmp4 electroporation only, the dI2s both expand and change location, such that they are intermingled with/ventral to the dI3 population. Interestingly, we see this shift in location occurring between the 25ng/μl and 50ng/μl condition in the Bmp4 concentration series. Thus, for 5 ng/μl and 25 ng/μl conditions, the dI2 population is larger following Bmp4 electroporation, but in the correct spatial order with respect to the dI1 and dI3s, i.e. midway between them. However, by the 50 ng/μl condition (which has >2-fold more dI2s than the 25 ng/μl, Figure 4J) the dI2 are now ventral to dI3s. One hypothesis is that as the dP2 Ngn1+ domain is depleted, the more ventral Ngn1+ domain, that normally gives rise ventral INs, is co-opted to make dI2s. We show this location change in the schematics depicted in Figure 2W-Y and now make explicit mention of this result in the legend for the schematics, as well as discussing it in subsection “BMPs have distinct roles directing dorsal spinal fates”. We chose to use RT-PCR as a standardised readout of the effect of BMP recombinant protein on gene expression. This approach permitted us both to a) perform a relatively quickly analysis of the many conditions in our mESC experiments and b) overcome technical issues that we had with immunolabelling mouse EBs, which generally do not stain as well as either human EBs or embryonic tissue. However, we did collect some immunohistochemical data in the early stages of this project and found that the RT-PCR quantification closely mirrored the cell counts. This data is not included in the study, but if the reviewer would like – we can mention this finding in the Materials and methods. Figure 4. Here- changes to concentration of plasmids electroporated are used as a proxy for changes in BMP concentration. This assays, quite rightly, by phospho SMAD expression. It would be nice to see some kind of quantitation of the effects of the different plasmid concentrations on SMAD expression. We thank the reviewer for this suggestion and have now included a quantification of a wider range of plasmid concentrations on R-Smad activity in Figure 4J. Both Smad1 and Smad5 are expressed broadly and at high levels in the embryonic spinal cord (see Hazen et al., 2012) making it unlikely that they are directly regulated by the BMPs. This possibility is supported by our mESC cultures: in our unpublished observations, we do find that the expression of Smad1 and Smad5 increases over time as mESCs differentiate into EBs. However, there is no significant difference in the Smad1/5 levels in the RA (control) vs. RA/BMP-treated (experimental) EBs. Again, the distributions of dorsal interneuron identities generated by these different perturbations do look different but it might be nice to do this direct comparison through the same concentration of plasmid across the different interneuron types to see if the different concentrations display the same distributions. Was this experiment performed in Figure 2 (and Figure 2—figure supplement 1)? In that study the same concentration of expression plasmid is electroporated for BMP4, BMP5, GDF7 and BMP7. We find that the same concentration of each of BMPs results in a range of different cellular activities. When we electroporated a range of concentrations of one of these BMPs, BMP4 in Figure 4, we find that we get the same range of cellular activities, but that BMP4 is more effective at higher concentrations. We apologize to the reviewer. We did not make it clear that it is important to compare only the electroporated sides in the control vs. experimental spinal cords in Figure 5 because of the wide-ranging effects of Bmp misexpression. We have added a further explanatory note to the figure legend, as well as noting that the effect on the Ascl1 domain is not as profound as the effect on the Atoh1/Ngn1 domain as also requested by reviewer 1. This experiment is an excellent idea, and we plan to use such approaches in our follow up studies. Here we have focussed on assessing how BMPs alter cell cycle dynamics in the mESC model system, to further characterise differences/commonality in our model systems between the BMPs and their effects on cell cycle. We have now added further in situ hybridization panels – Figure 7 B and E – which show that while BmprIb is not expressed at HH stage 18, it is broadly expressed by HH stage 21, when dorsal neurons start to differentiate (timeline in Figure 1). We have removed the mention of cell cycle exit in the results and altered Figure 6O and 7U such that they are now summaries of the data, i.e. how a given BMP alters progression through the cell cycle, without implying a functional consequence. The data is complex and we believe these summaries will help guide the reader. We have further clarified that the final model is our interpretation of the data, and added the statement similar to “other experiments are needed” to the manuscript. We are most grateful to Jeff Golden, Thomas Jessell, Ed Laufer, Thomas Müller, Bennett Novitch for reagents and Daniel Sivalingam for early technical help. We would also like to thank Tanmoy Bhattacharya, Karen Lyons, Harley Kornblum, Bennett Novitch and Sandeep Gupta, as well as members of the Butler and Novitch laboratories past and present, for invaluable discussions and comments on the manuscript. This work was supported by fellowships from the Broad Center for Regenerative Medicine at UCLA and the Rose Hills Foundation and the NICHD T32 training grant (HD060549) in Developmental Biology, Stem Cells and Regeneration to MGA, fellowships from the California Institute for Regenerative Medicine (CIRM) Bridges to Research program (TB1-01183) for LdC and EO-B and grants from CIRM (RB5-07320), the National Institute of Health (NIH) (NS085097) and the UCLA Broad Stem Cell Research Center to SJB. © 2017, Andrews et al.